Hello, welcome back to the blog. 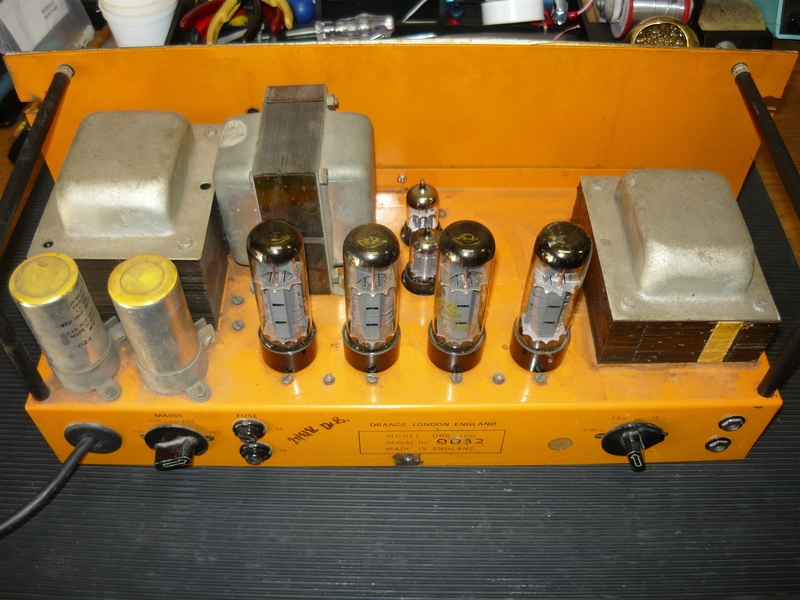 We are now offering world-class (non-warranty) service & repairs to the range of valve (tube) amplifiers from Jackson Ampworks of Keller, Texas USA. We should point out that we have no official relationship with Jackson Ampworks, so we cannot accept any warranty repair claims without the endorsement of their Australian distributor. 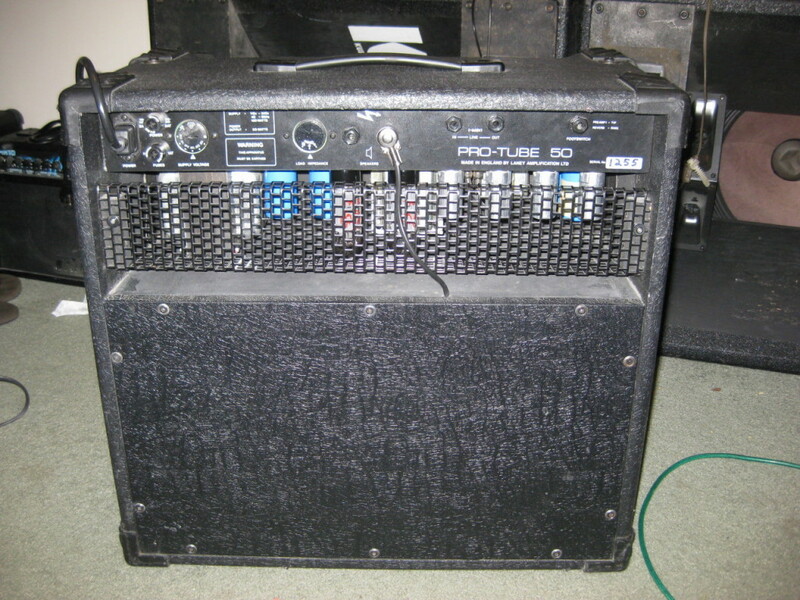 We recently serviced the Jackson ‘Britain’ amp for one of our customers, who is a guitar tutor and professional player – the amp is featured in the accompanying photos. 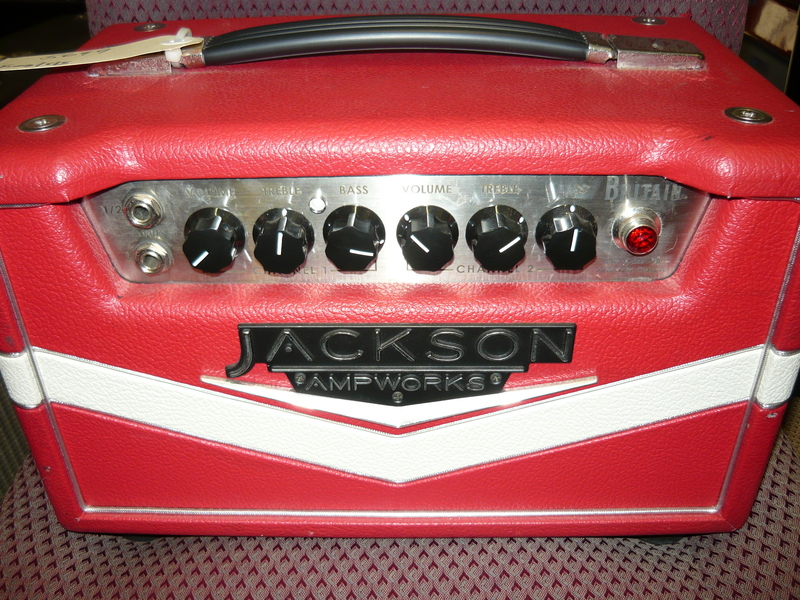 The Jackson amps are built in Texas, but are British-voiced. The concept of the Jackson ‘Britain’ is broadly similar to our own Richards ‘Expressionist’ amplifier models – there are two discrete preamp channels, voiced as per vintage VOX amps. CH-1 is based on the EF86 pentode preamp valve (tube), and CH-2 employs the more familiar 12AX7/ECC83 valves and is effectively the top-boost channel. The EF86 is famously rather prone to microphony in guitar amps, but sounds absolutely wonderful in the right situation. 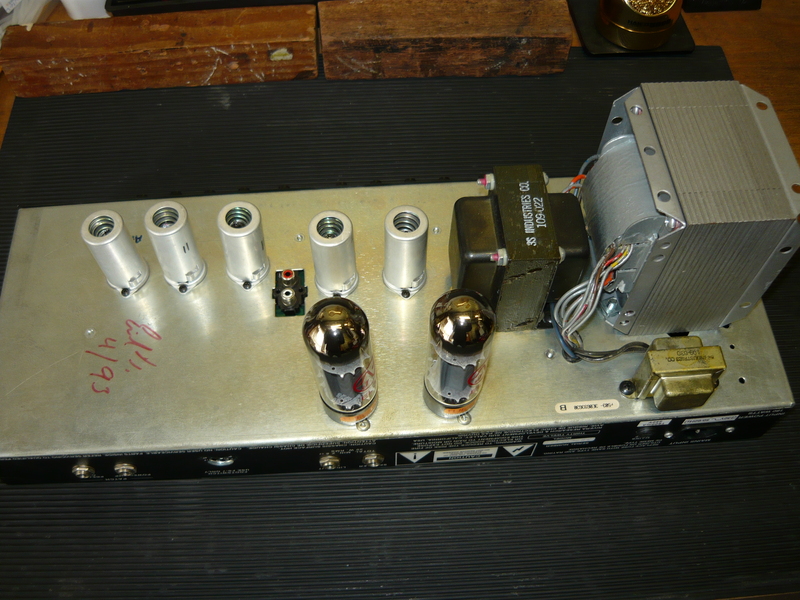 The ‘Britain’ power amp section is switchable between a pair of cathode-bias EL84 valves for low power, and a pair of fixed-bias EL34 valves for full power. 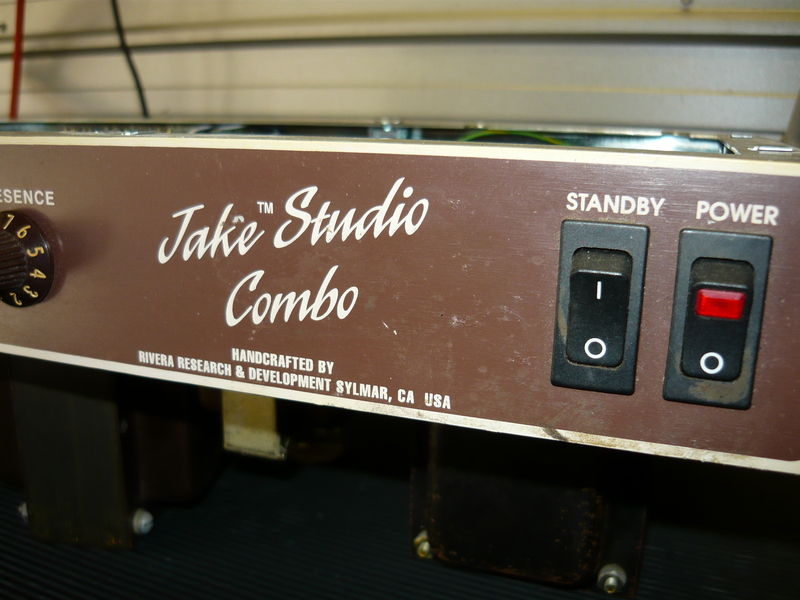 The Jackson amp is very compact – about half the size of most comparable amps, ie amps in the 30 to 50 watt range. This amp depends absolutely on forced-air cooling for its survival, so if the fan ever stops working the amp needs to be serviced a.s.a.p. Some of the amp functions normally carried out by passive components appear to be implemented with the use of solid-state devices, which are mounted to vertical heatsinks, also in the forced-air cooling path. Fortunately, for this service job there was nothing more serious than some noisy valves, which we replaced accordingly with a full check & test. 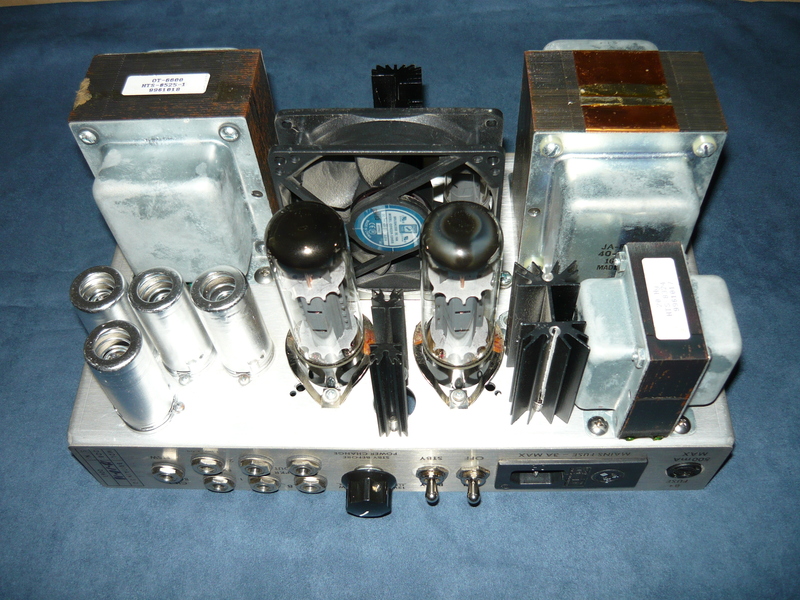 The only problem we encountered was that the light aluminium chassis was quite resonant, at a frequency that was very close to the resonant ring from certain brands of EL34 power output valve that we tried in the amp. 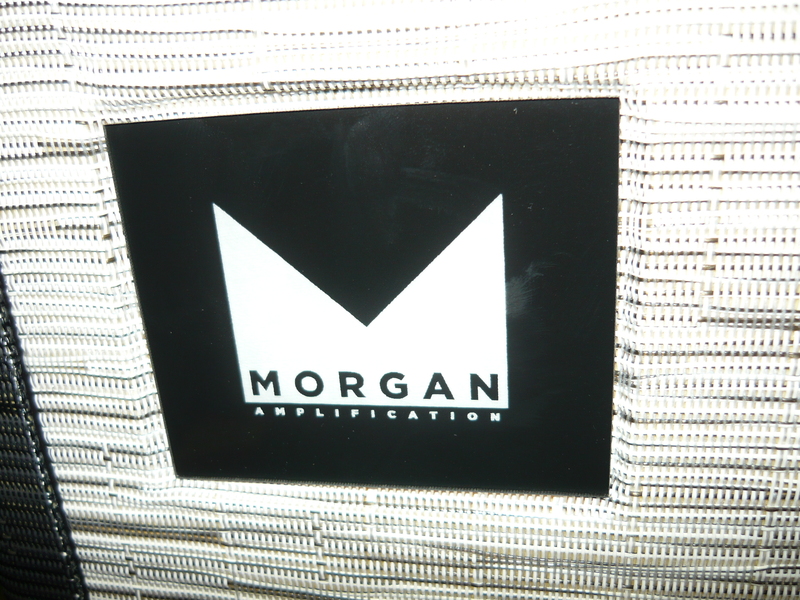 This was so noticeable that we substituted several brands before settling on the least resonant combination. Finally, we were happy with the end result and our customer was pleased to get his amp back, working correctly again with unwanted noise at a minimum. 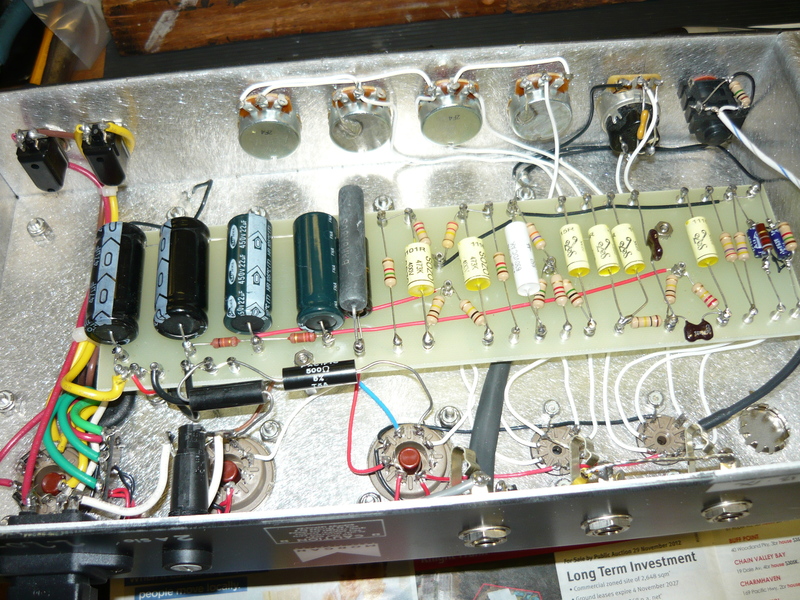 You can see from the photo to the right that the amp is indeed hand-wired and the chassis layout is very tight indeed. 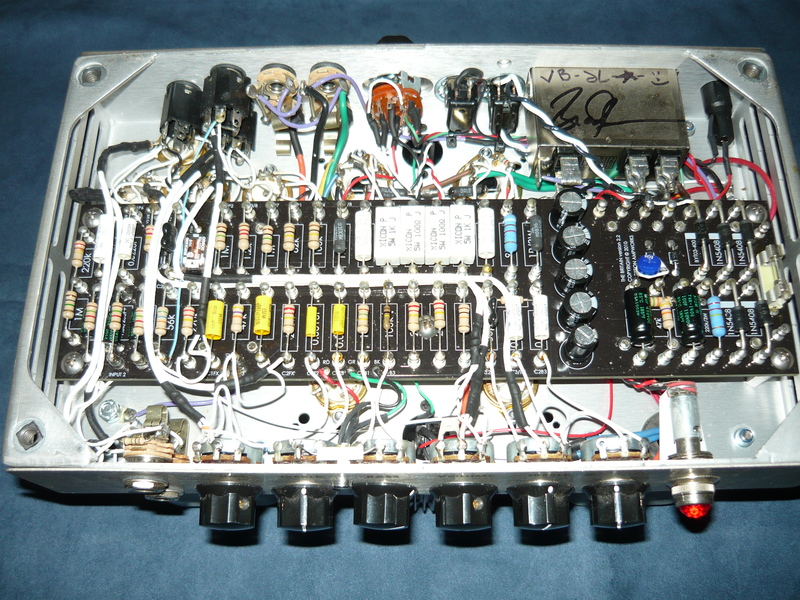 Access to some components is limited or not possible at all without stripping out the electronics from the chassis. Welcome back to the blog ! 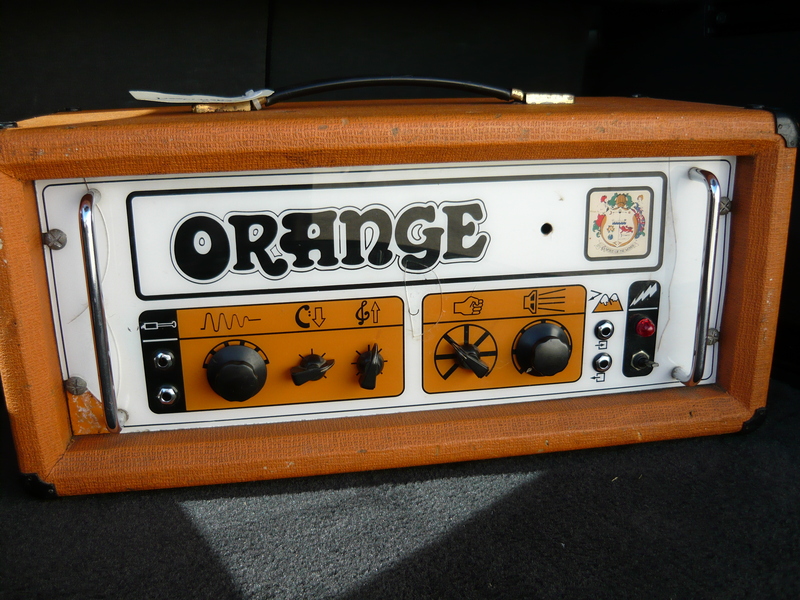 This week we look at a major overhaul to a battle-damaged classic from around 1971 – the Orange ORS100 “pics-only” head. 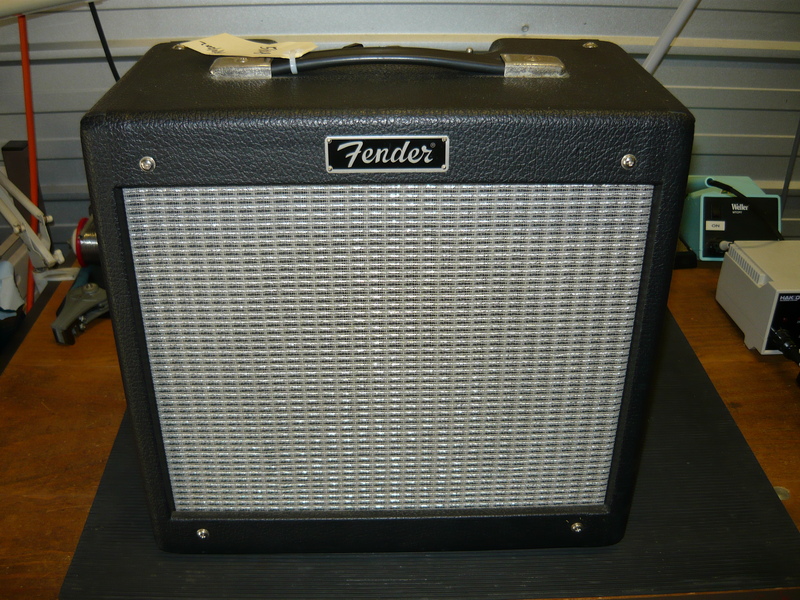 Our very good customer David Challinor, guitar & vocals from the band Sounds Like Sunset, had recently acquired this vintage masterpiece, but in its existing condition the amp was quite unstable and of dubious electrical safety. 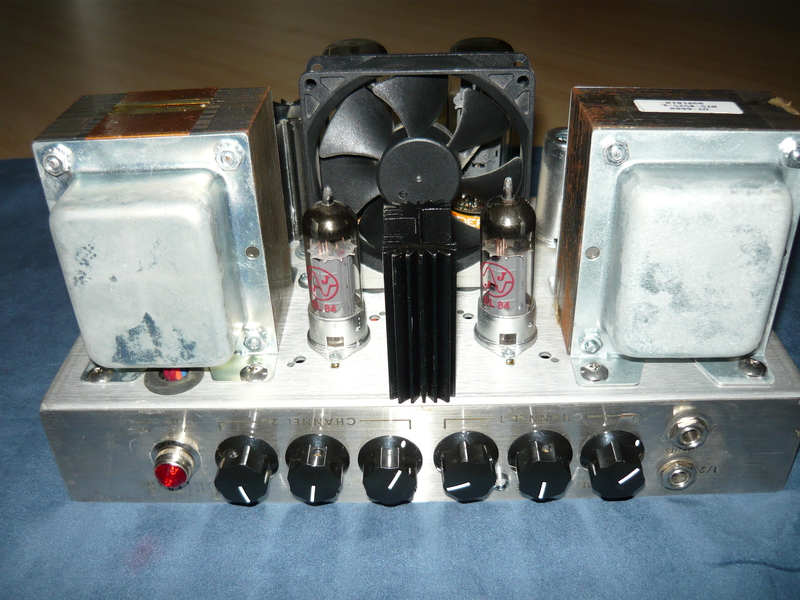 Dave contributed the Vadis/Galaxie amp that we blogged back in January 2012, which has been one of our most widely read blogs (for Australian readers). 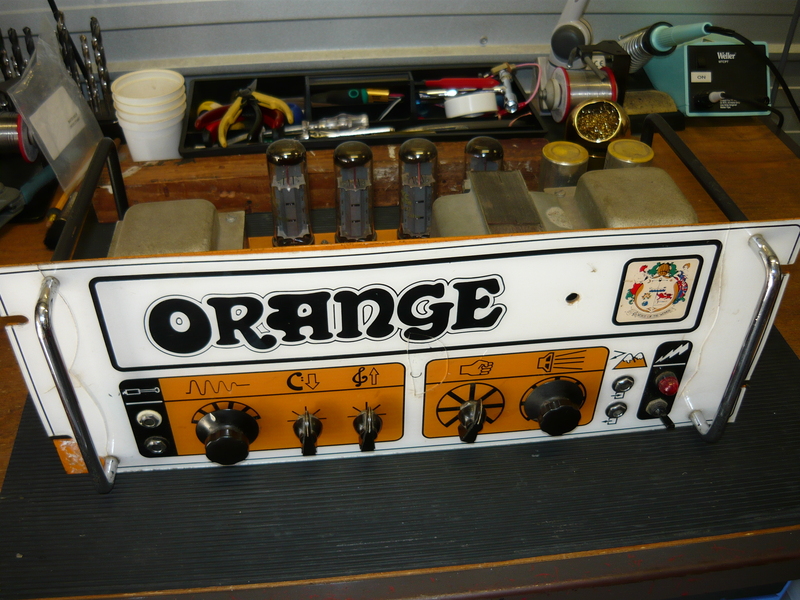 We have previously discussed the servicing of Orange amps back in April 2012, October 2011, & May 2011, but those amps were products of the contemporary Orange company. This is our first ever blog of an original Orange from 40 years ago. 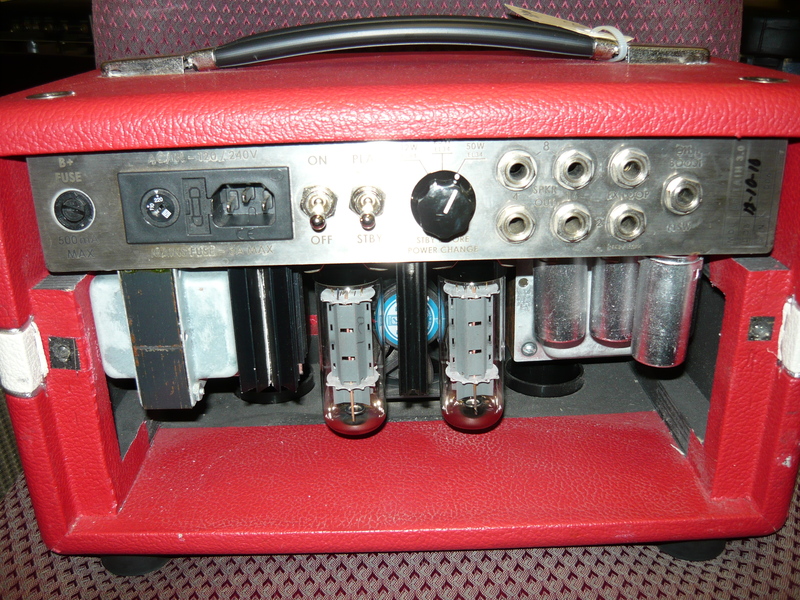 Any guitar amp this old will have numerous issues to be resolved, including electrical safety, some components (eg electrolytic capacitors) will be well past their use-by-date, and also there will have been repairs carried out on-the-run which may well have to be corrected to produce a stable amp which performs as originally intended. 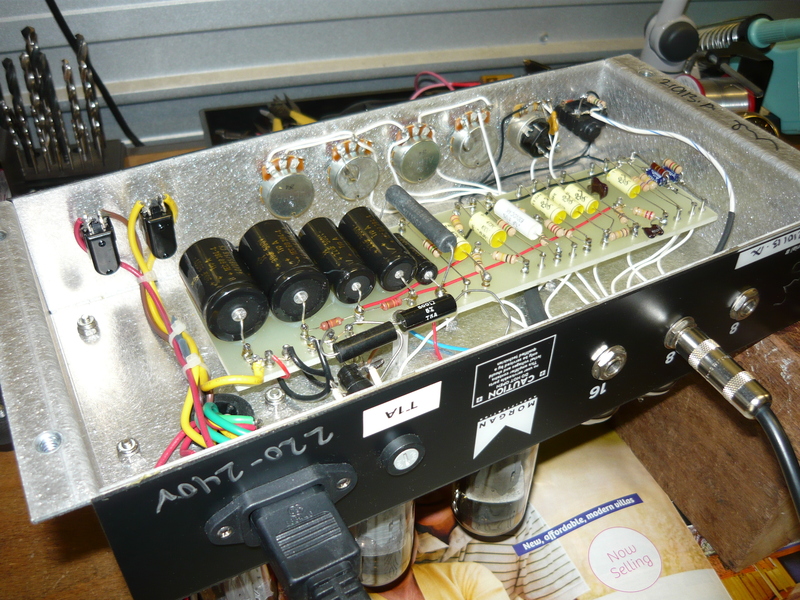 This amp is designed to run its quad of EL34 power output valves at a very high 525V DC, similar to some very old Marshalls from that era. This places additional stress on modern production EL34’s, as well as being a potential source of problems for printed circuit board designs. 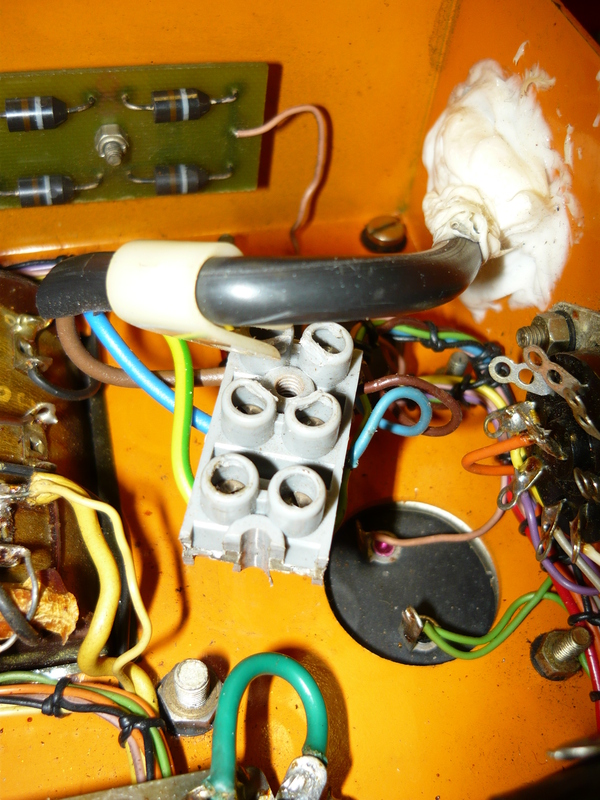 Sure enough, there had been a melt-down in this amp, probably many years ago, which resulted in permanent damage to the p.c.b., with some tracks & pads having lifted, required the circuit to be completed with wire links. This had been repaired reasonably well previously, and we carried out some additional repair work in this area. 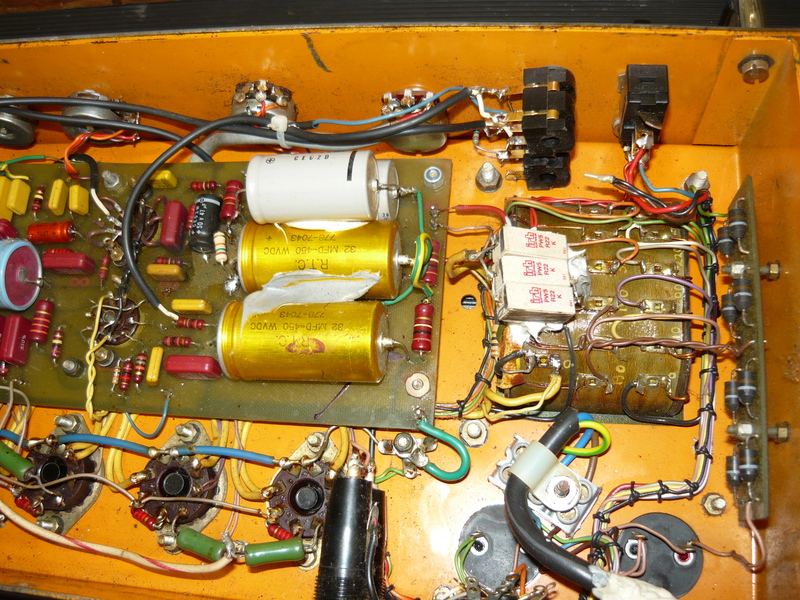 You can see from the photo immediately above, the amp had been modded with the addition of zener diodes to lower the EL34 screen grid voltage. 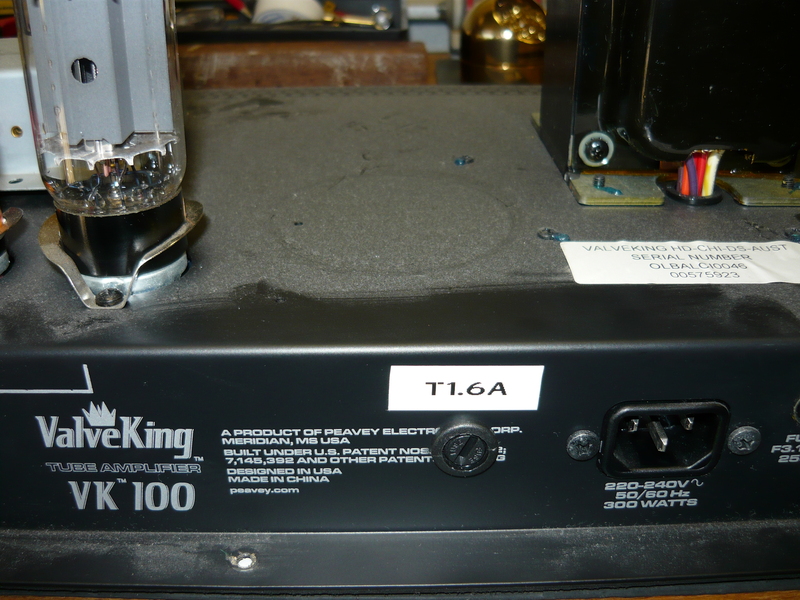 Quite amazingly given the high DC volts, there was no bias adjustment available on this amp. 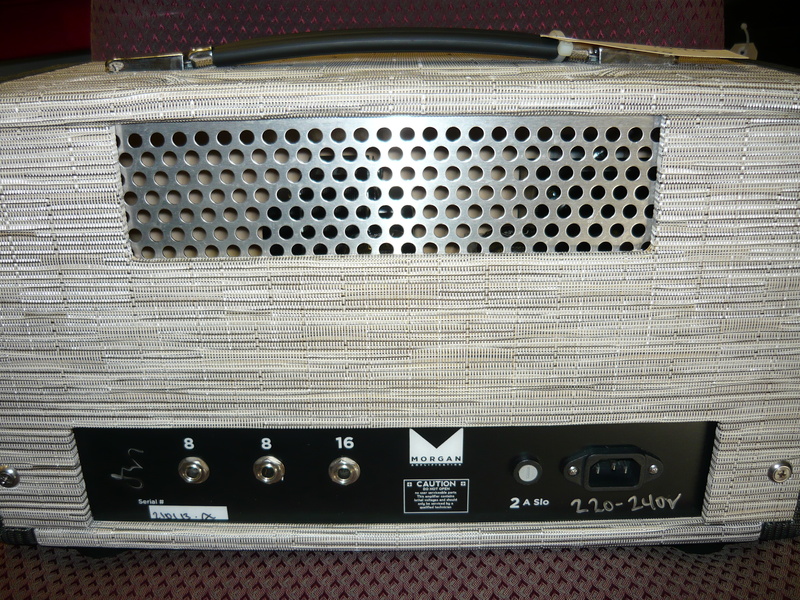 Our agreed strategy was to restore the amp where possible to the original design, and update selected components, plus create an adjustable bias supply for the EL34’s. 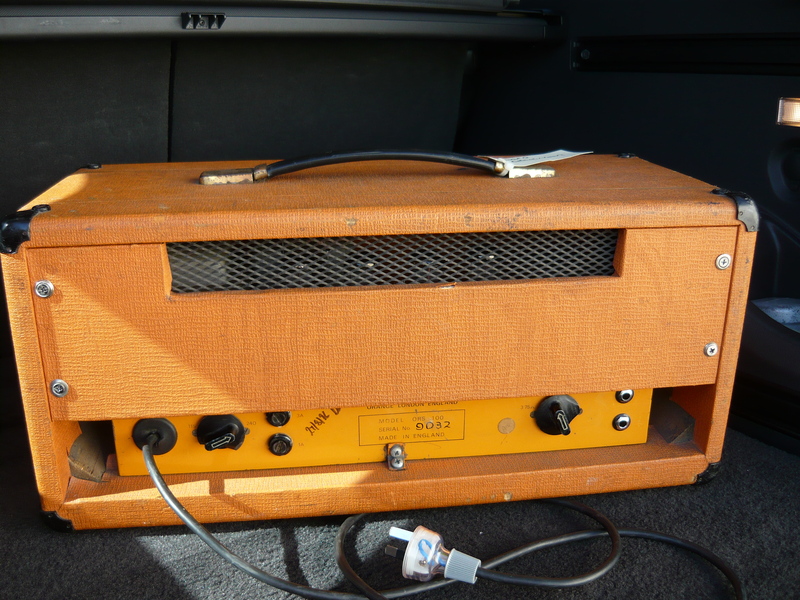 In Dave’s words: if you are able to drag the amp from being a potentially lethal museum piece & back to its former glory, then please proceed ! The trickiest bit was removing the p.c.b. from its position without introducing any more problems. 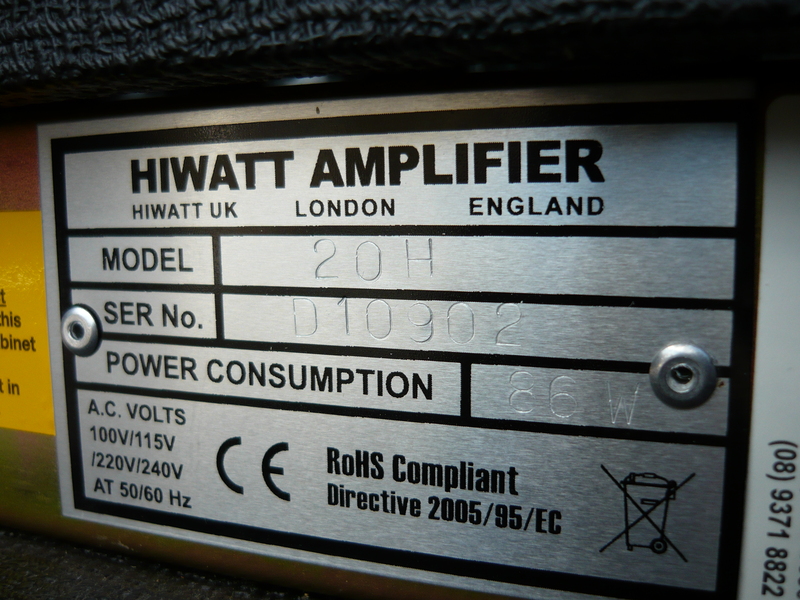 These amps were really well made, built like a proverbial British tank, but employed single core wire, which as it ages becomes rather brittle and prone to breakage. We cleaned up the copper side of the board and replaced all 9 x electrolytic capacitors, together with some 2 watt carbon film resistors. 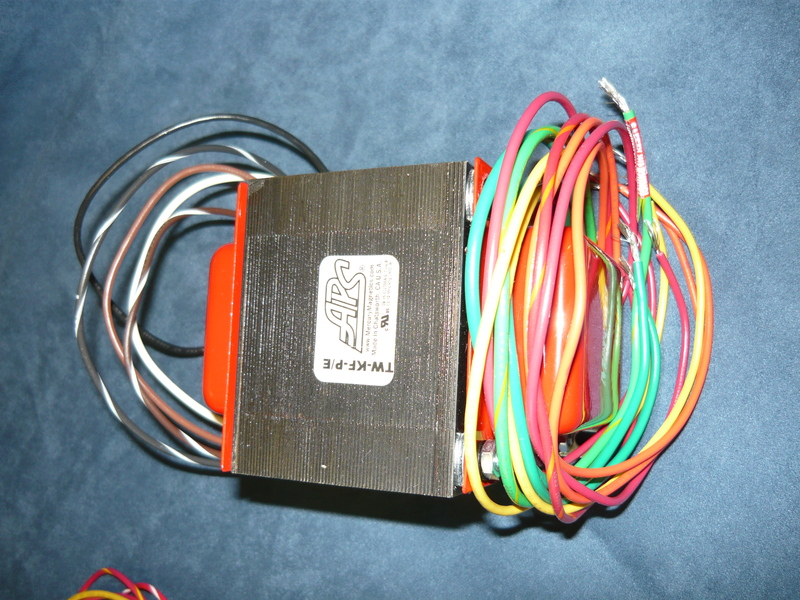 We installed a bias trimpot in place of a fixed resistor, which gives a very broad range of adjustment, permitting the installation of various EL34 alternatives, eg E34L or KT77. 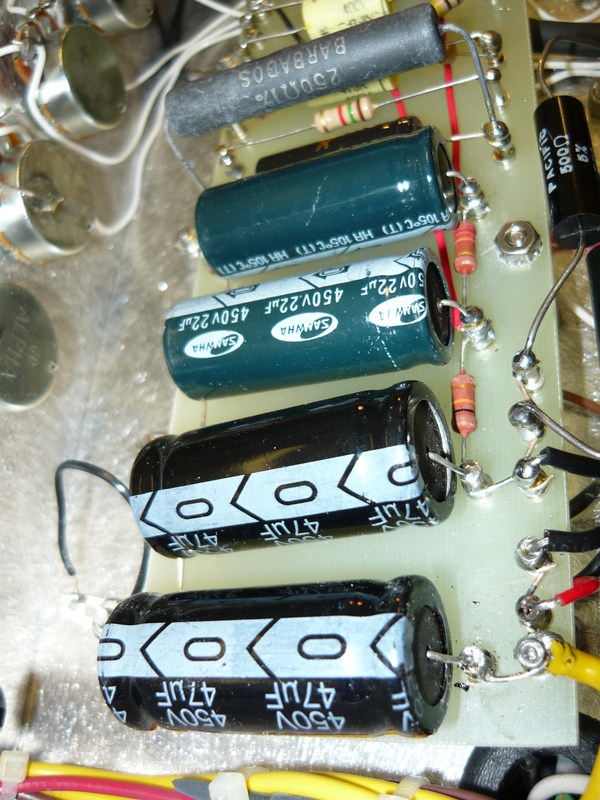 We bedded down the high voltage capacitors in a blob of silicone for stability. We replaced the 4 x worn out pots and added an earth wire to the rear of the pots to improve shielding. 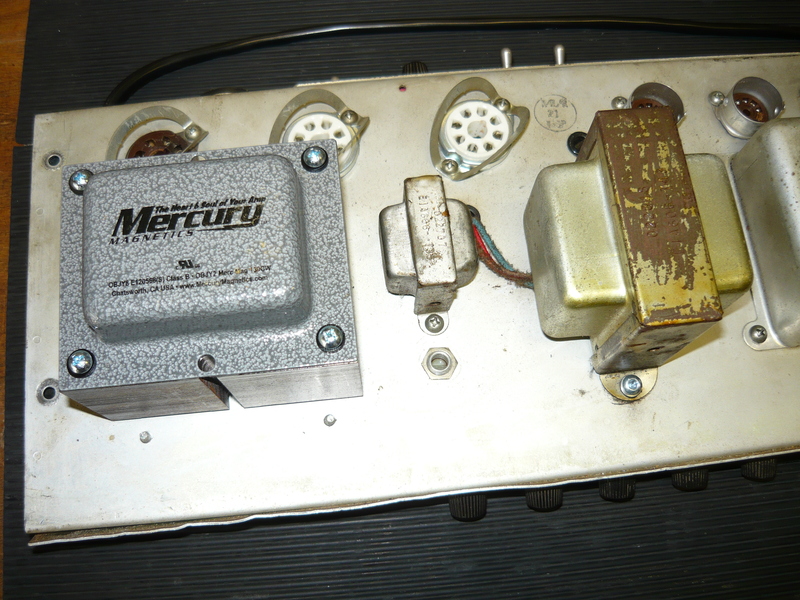 External to the board, the pair of vertical mounting 100uF/500V main power supply caps were replaced. All jacks & 9-pin valve sockets were cleaned with DeOxit. 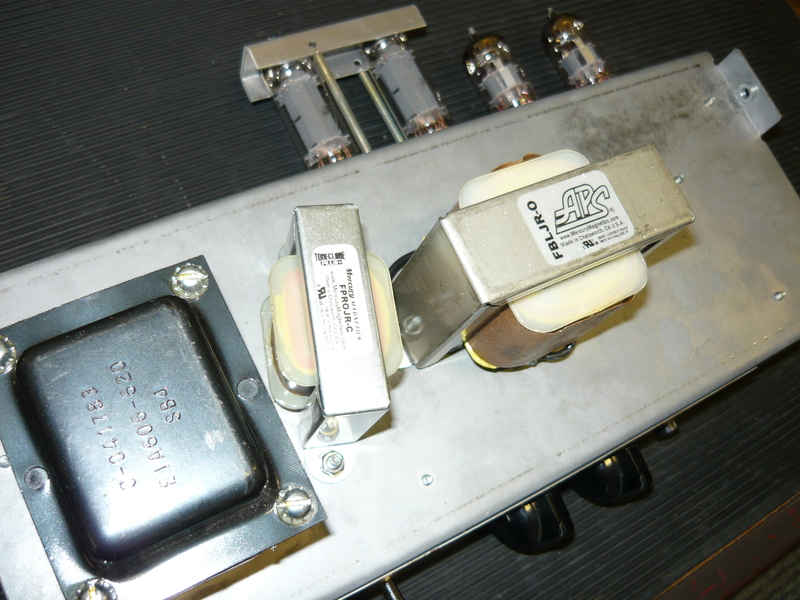 V1 & V2 were replaced with JJ 12AX7-s valves, which would be a reliable choice given the rather high cathode voltage in the V2 phase-splitter stage. The EL34’s tested OK and were retained. We found that the earth connection to the terminal block in the photo to the left had a stripped thread, which meant that the earth connection could not be tightened ! We replaced the terminal block and added a multi-strand earth wire connection direct to the chassis. 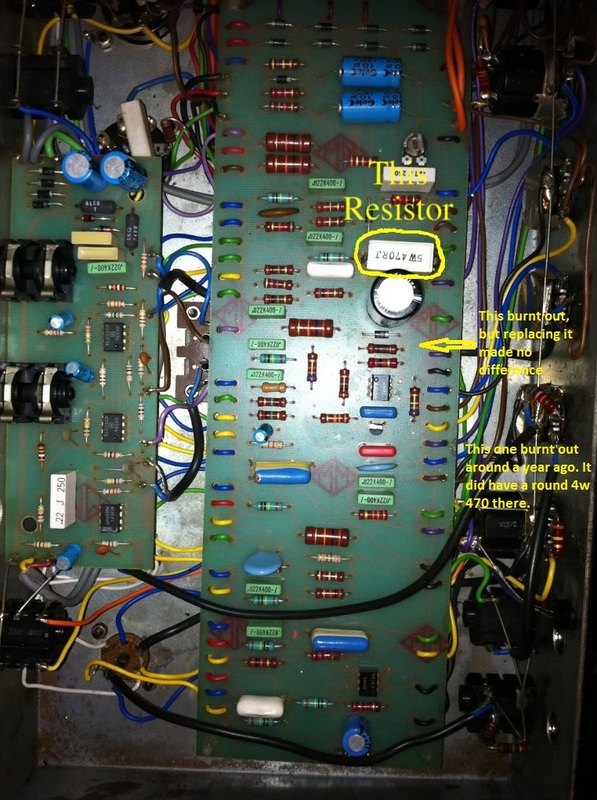 One unusual feature of the ORS100 design, especially compared to the published schematics of vintage Orange amps available on the internet, is that the huge filter choke actually carries the entire HV current draw of the amp, not just the screen grids & preamp valves. This probably has a positive impact on the amp’s performance when driven into clipping. However, the down side is that the voltage on the EL34 screen grids is too high. As a general rule of thumb, the voltage on the screen grids should be lower than that on the anodes, so we increased the value of the 4 x screen grid resistors, and installed those W22 series enamel body resistors which are intended for the harshest conditions. The customary earth shield between the input jacks & the output transformer connections was missing, presumably lost at an earlier unknown repair job. Given the proximity of the input jacks to high voltage (HV) wiring, this was a contributing factor to the amps instability issues. Luckily we had a suitable shield in stock which we had manufactured for our own Richards amps, and you can see it has been installed in the photo to the left. After hours of work we were finally in a position to carry out a PAT test and a power output test. The result was 30V/8 ohms = 112 watts @ onset of clipping. What did the ORS100 sound like ? 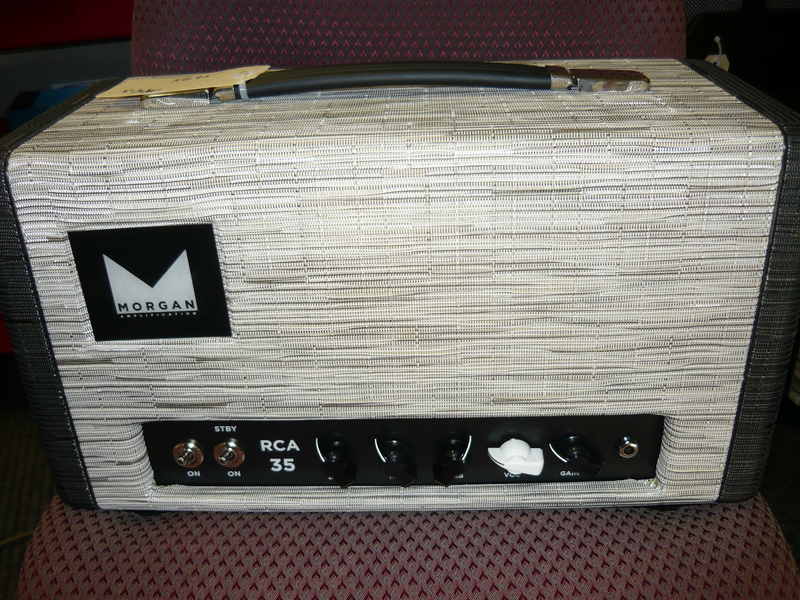 This amp is designed to be played loud ! We gave it a blast in the workshop, and the more we turned it up, the better it sounded. The treble, bass & presence controls are very effective, but we really preferred the 6-position FAC switch on maximum anti-clockwise for a maximum full-bodied tone. 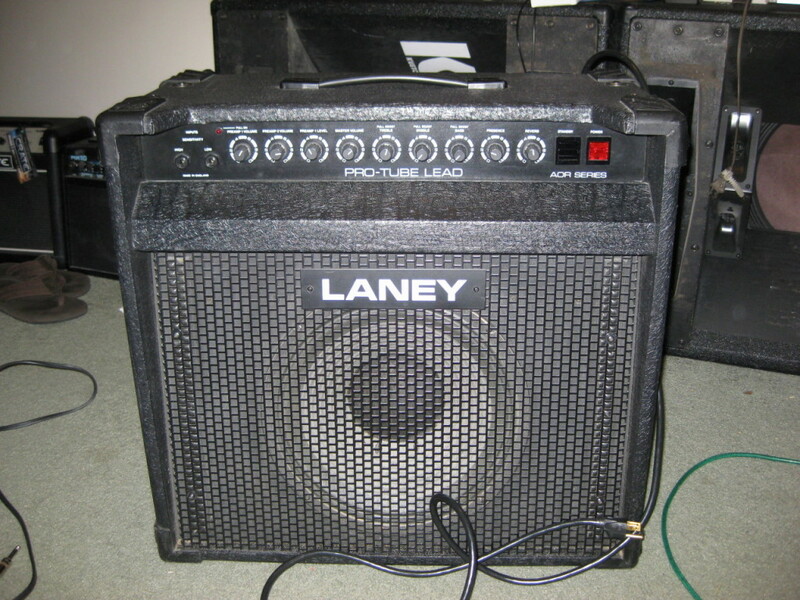 There may not be too many venues left where you can actually use this amp to its full capability. HI Ivan – the Orange was wonderful, thanks ! Enormous sound. I love it !! Once again the Orange was phenomenal at rehearsals. It’s my new favourite amp. I think it’s because it handles pedals so well too. 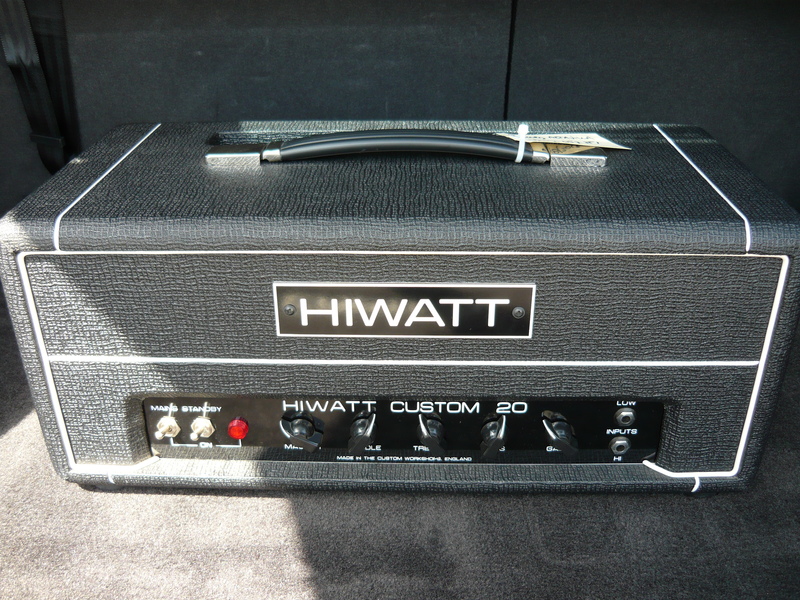 I really, really love this amp & as always your work is top notch. Thanks Dave, we love that kind of talk. IR. 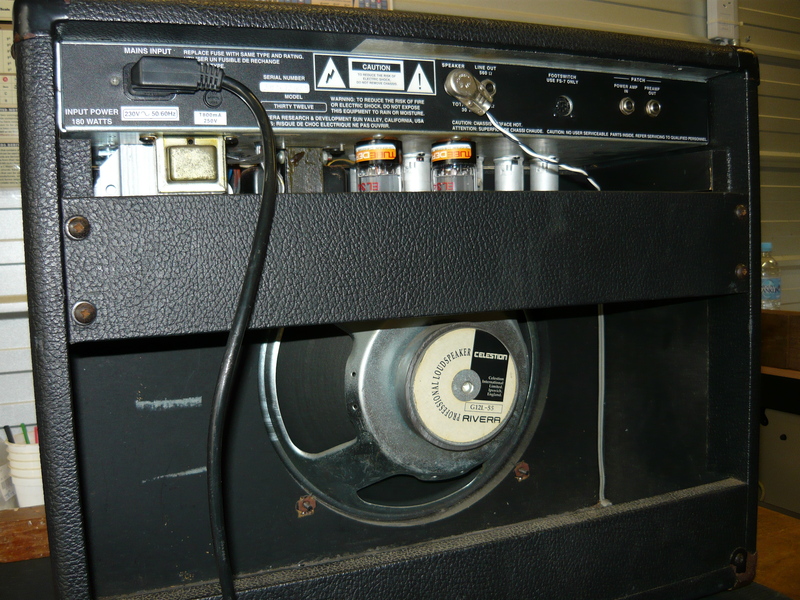 We are now implementing mods & upgrades to a broad selection of guitar & bass amplification, primarily valve (tube) but occasionally solid-state as well. 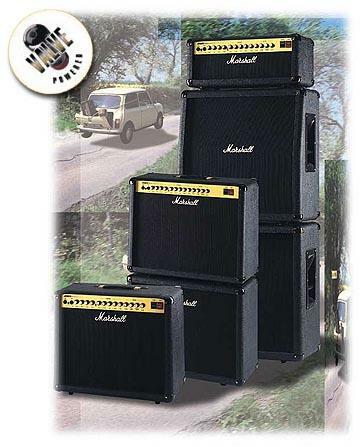 The most common examples are the Fender Pro-Junior & Blues Junior models, however we have been selectively modding Marshall amps since the 1980’s. In this blog we have a quick look at the Marshall JTM600 & JCM600 series amps – it would appear that the differences between the two are limited to cosmetics & choice of speakers, the electronics remains the same for both series. 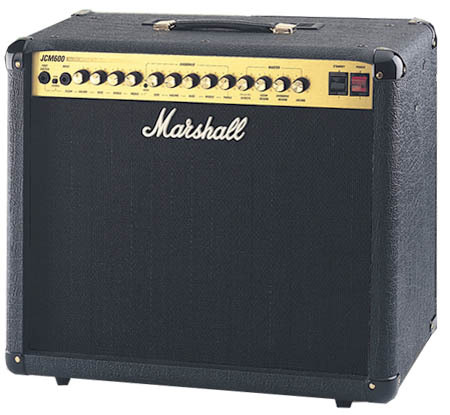 These amps remain among the more obscure of Marshall’s amp offerings of the last 20 years or so, very few guitarists would have played through one of them, let alone owned one. 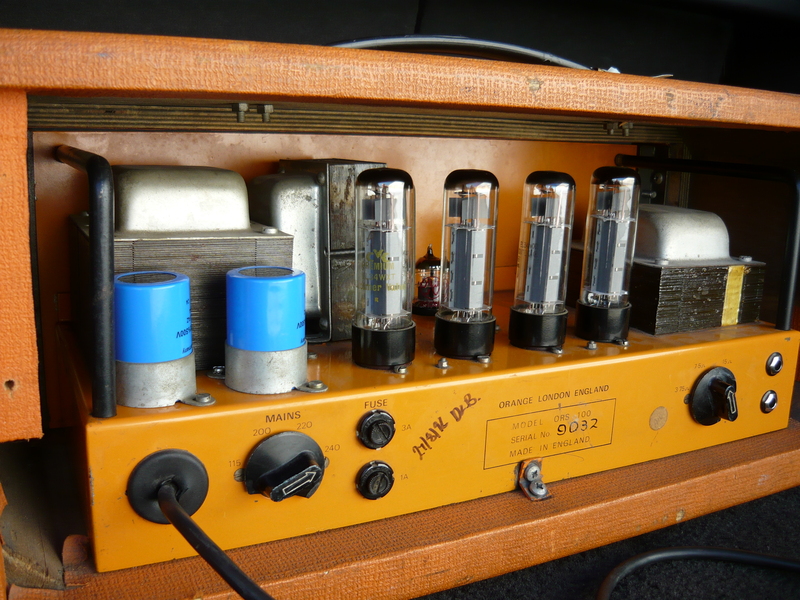 We do have a few Central Coast (NSW) customers that quite enjoy these amps, including “Gazebo”, the man who inspired this blog by commissioning us to mod his JTM60 amp head (we modded the “clean” channel only). These amps don’t have a great reputation for reliability. 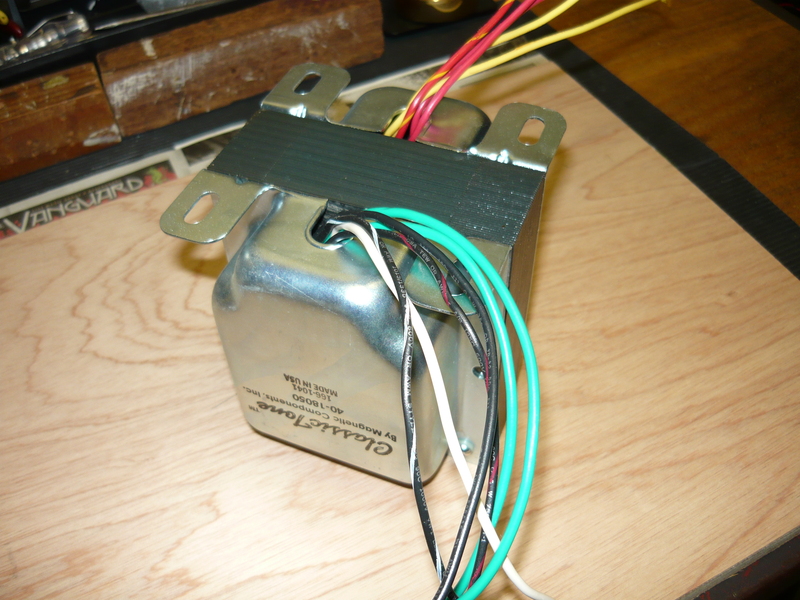 We have replaced several transformers over the years, for example. 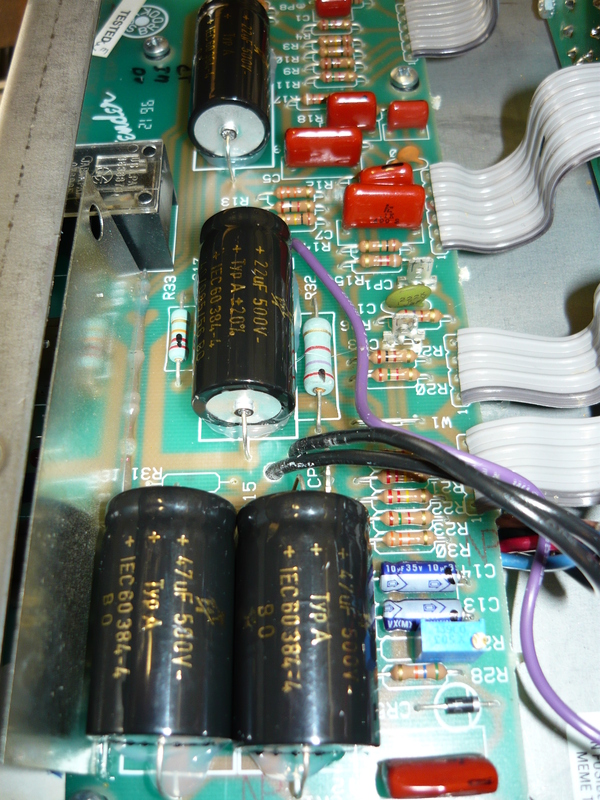 The first batch of JTM600’s were blowing the main high voltage filter capacitors during the warranty period, although this problem has obviously been resolved. They are not particularly easy to work on – getting the circuit boards out and re-installing them is quite time consuming. Operating the EL34 power output valves (tubes) in the horizontal plane rather than the more conventional vertical plane is just asking for trouble. 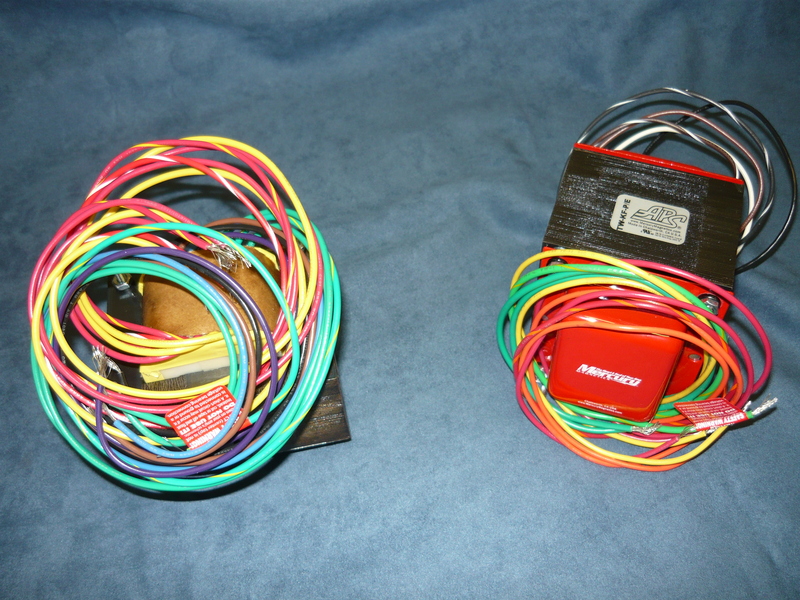 You have to choose your EL34’s carefully – with some brands there is the potential for an internal short-circuit to occur, if the heater filament sags for example. Please note, this is not normally a problem with the 12AX7 preamp valves. 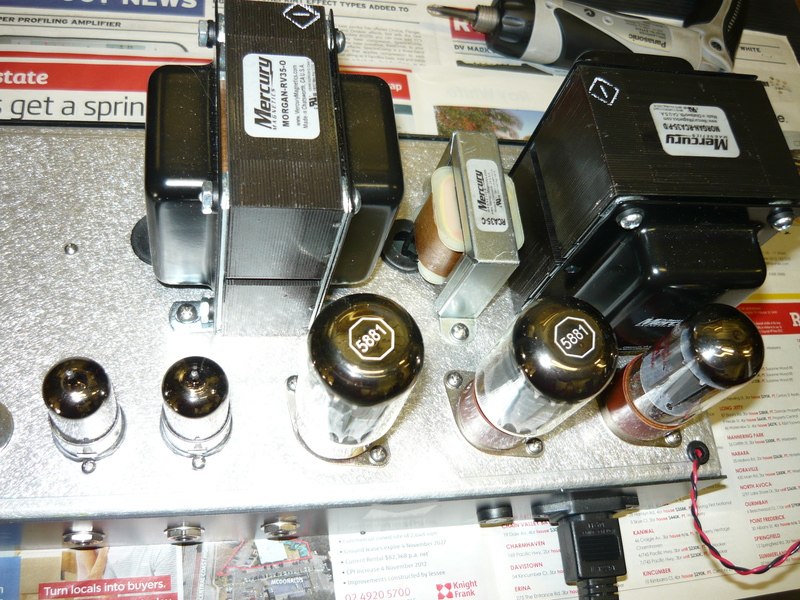 Regardless of your choice of valves, most of the heat from the power output valves goes straight up into the amp. 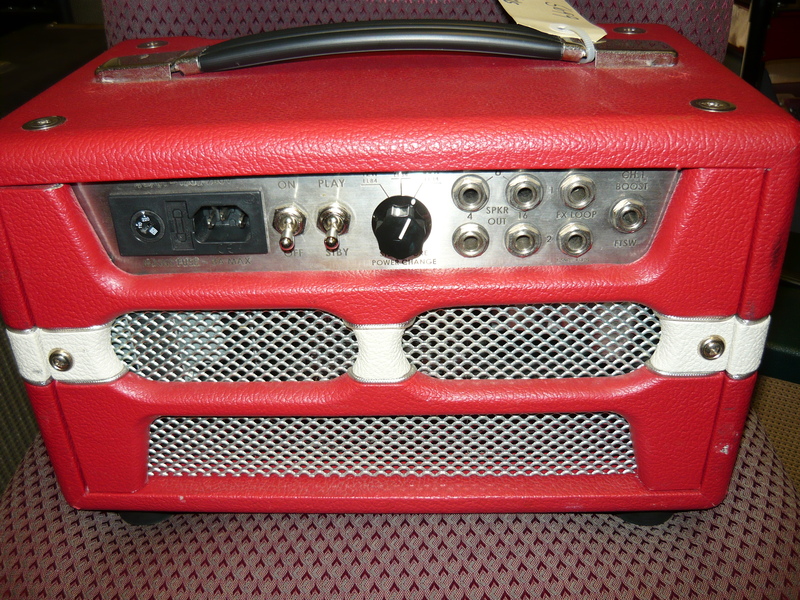 Over the years, we have tried to come up with ways to “bullet proof” these amps. Not all EL34’s like high voltages on the screen grids, for example. 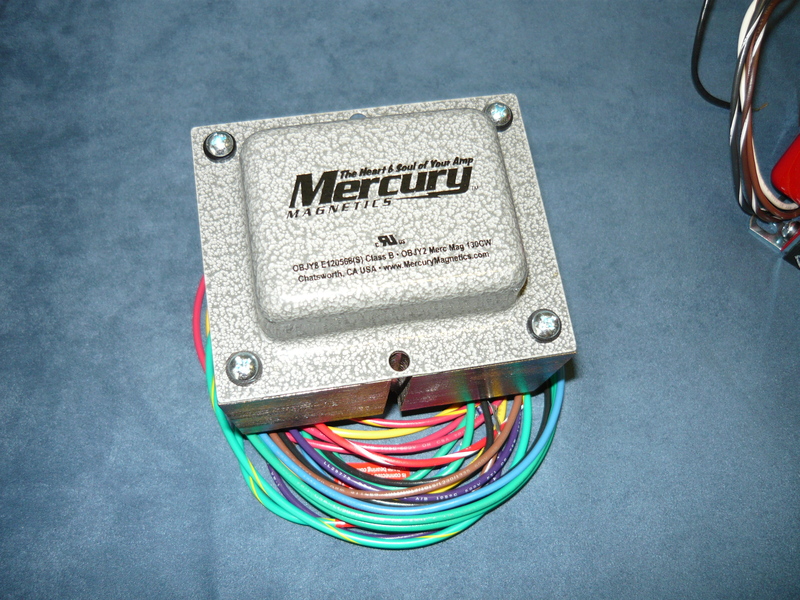 Installing a small DC powered cooling fan may assist the issue of heat build up within the chassis. The JTM30 model has presented less problems, but has one stupid design mistake – a non adjustable bias supply voltage, which complicates replacing the 5881 output valves unnecessarily. 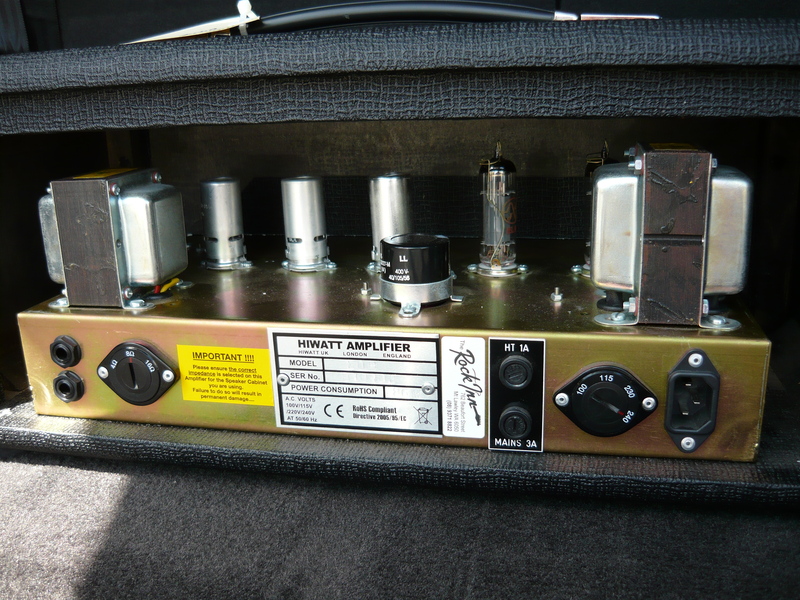 Stock, the 60 watt amps sound a bit thin and a bit sterile. 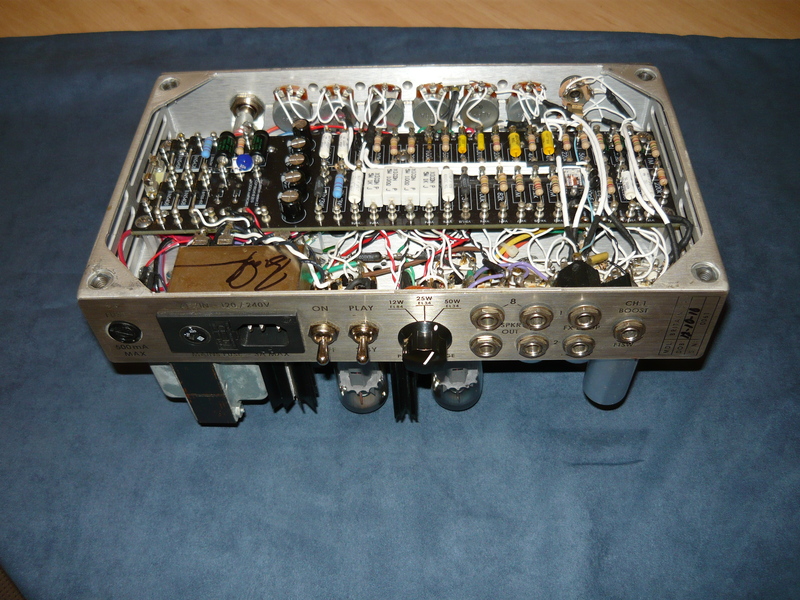 The “lead” channel develops a type of distortion that sounds like it came from a stompbox, rather than from a valve amp. The main focus of our mods is to convert the “clean” channel to a circuit sounding as close as possible to a Marshall model 1987, ie a blues/crunchy tone with more fat bottom end and crisp high end. 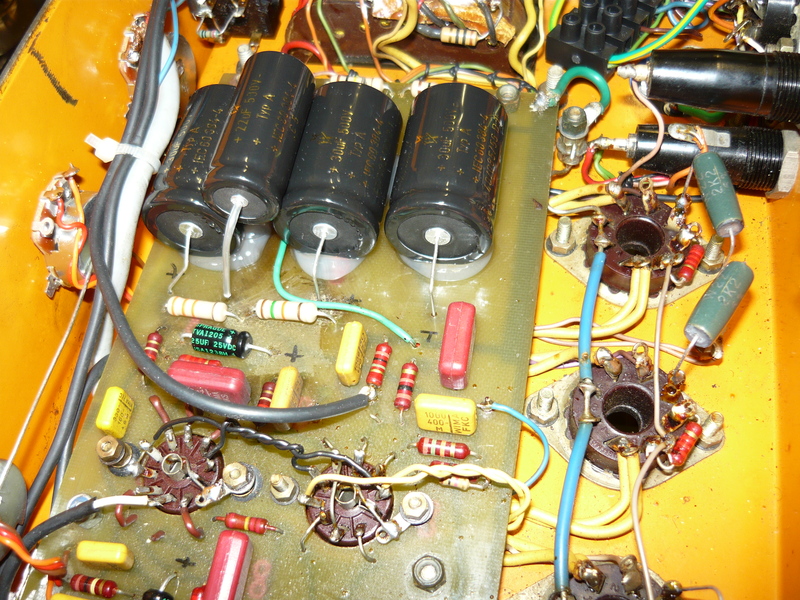 This is achieved by substituting selected components (resistors/capacitors) with more traditional “plexi” circuit values. This is what we achieved for “Gazebo” just this week. Once the job was completed, the “clean” channel was suddenly very useable for many styles. 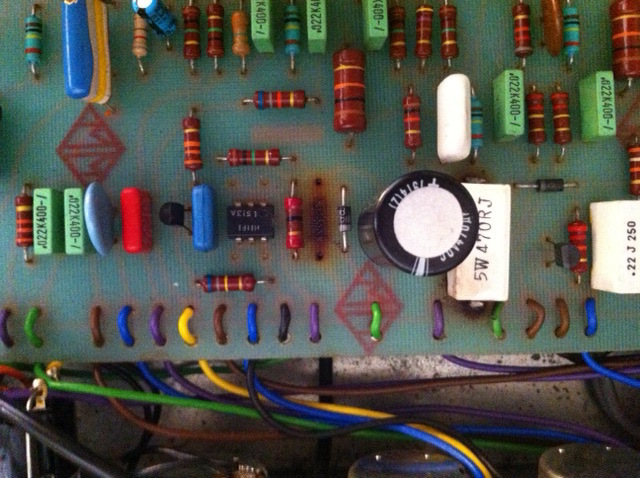 With the “lead” channel you could easily go overboard, spending hours rebuilding the whole circuit. 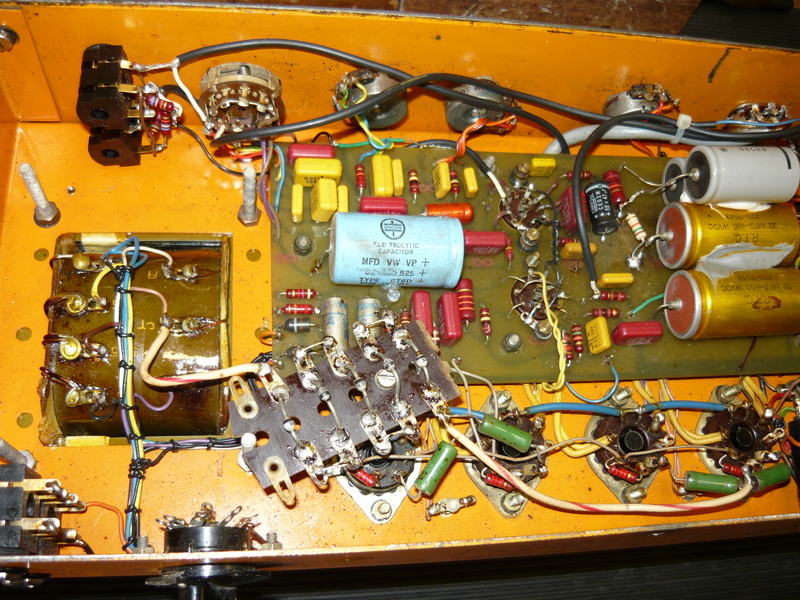 The simplest approach would be to remove the clipping diodes for a more natural valve (tube) medium distorted tone, although having done this it may be necessary to make some changes to balance the circuit for the now much higher signal levels. 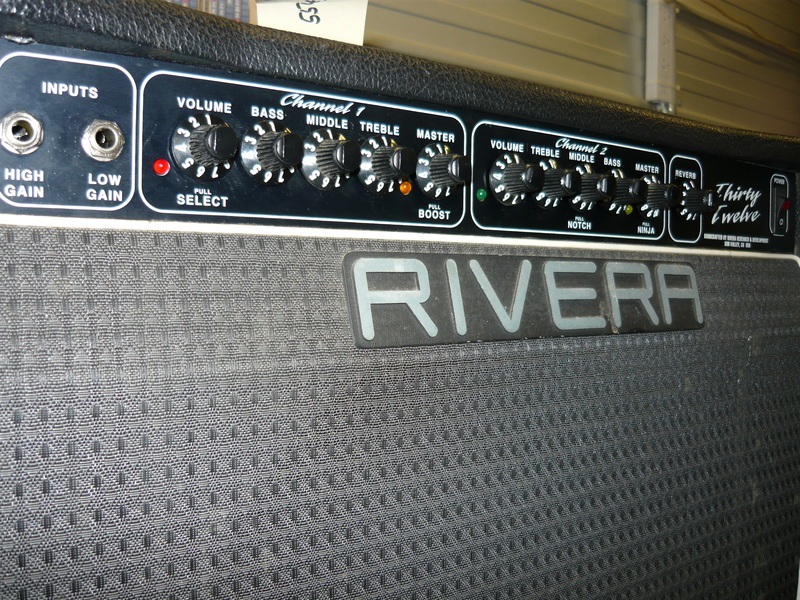 Modding the clean channel as described, plus limited mods to the lead channel is a cost effective way to significantly improve the performance of these amps. We need to allow a minimum of 2 hours labour for this work, plus materials. We would have to quote re specific improvements to the power amp, eg adding a cooling fan, etc. Regards – I.R. Hello. 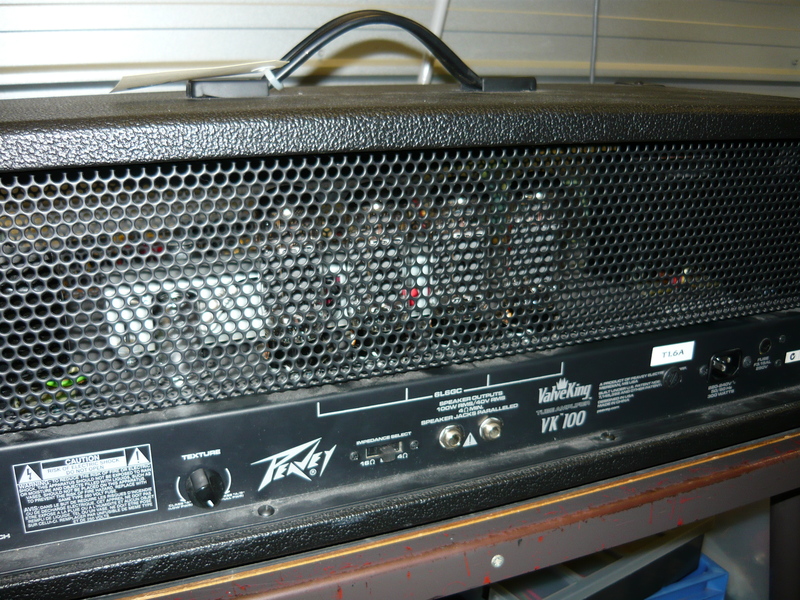 This week we received at the workshop one of the more recent Peavey made-in-China valve amp heads for repair. One of the ‘Valve King’ models, this is the VK100. Stated fault was – the amp just stopped. 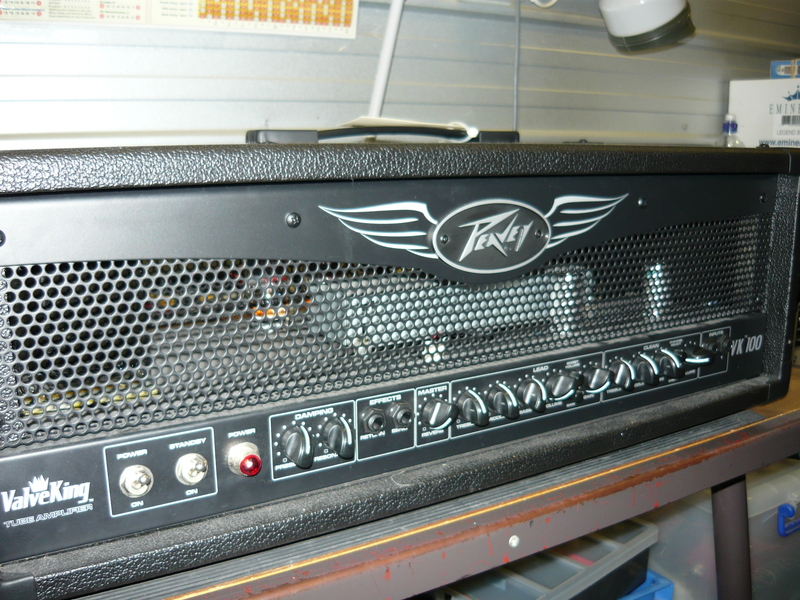 We have been repairing Peavey amps since the 1980’s, by the way, including warranty work, but we have noticed a steady decline in the serviceability of their amps and will only accept non-warranty repairs these days. 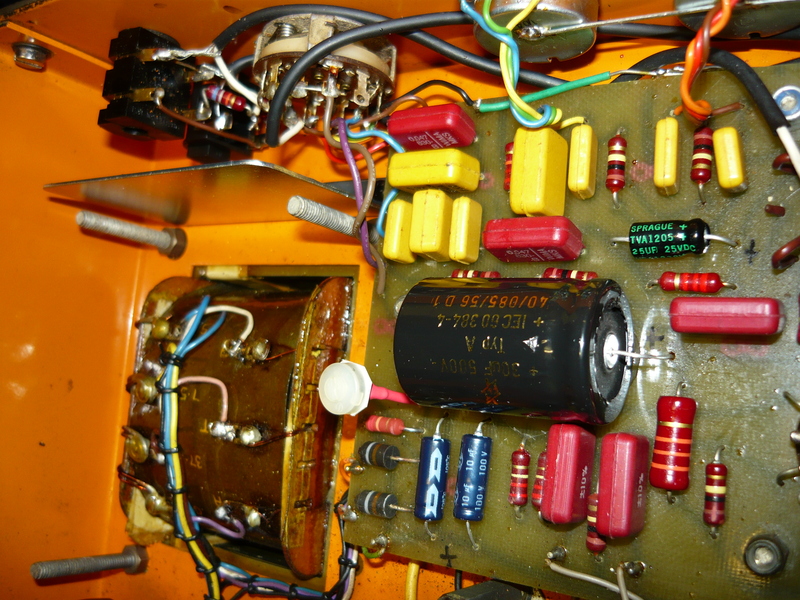 The amp indeed would not power up, and examination of the mains fuse, actually the only external fuse, revealed that it had not blown, so the next step was remove the chassis from its sleeve. The fuse for the HT (high voltage) supply, F201, is located on the main p.c.b. Obviously one or more of the 6L6GC power output valves had gone S/C (short-circuit), causing the HT fuse to blow. 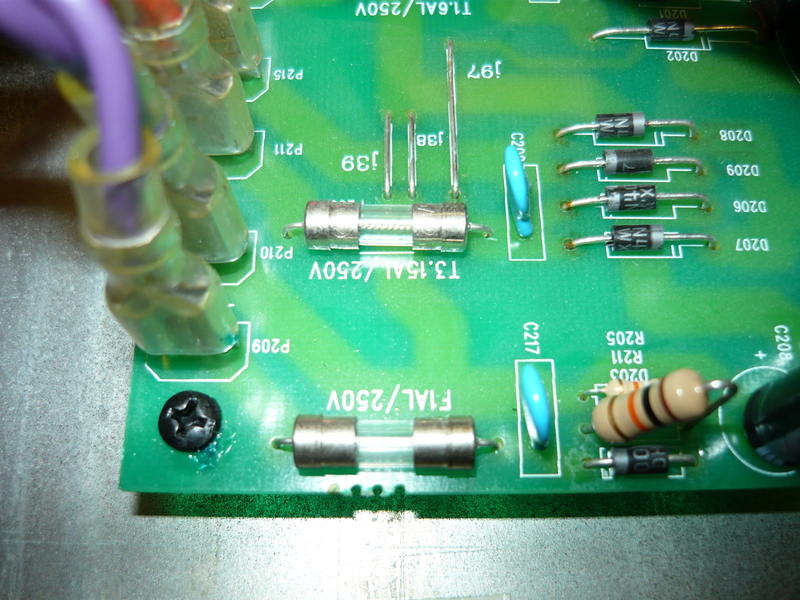 Unfortunately, F201 is a miniature glass fuse directly soldered into the p.c.b. 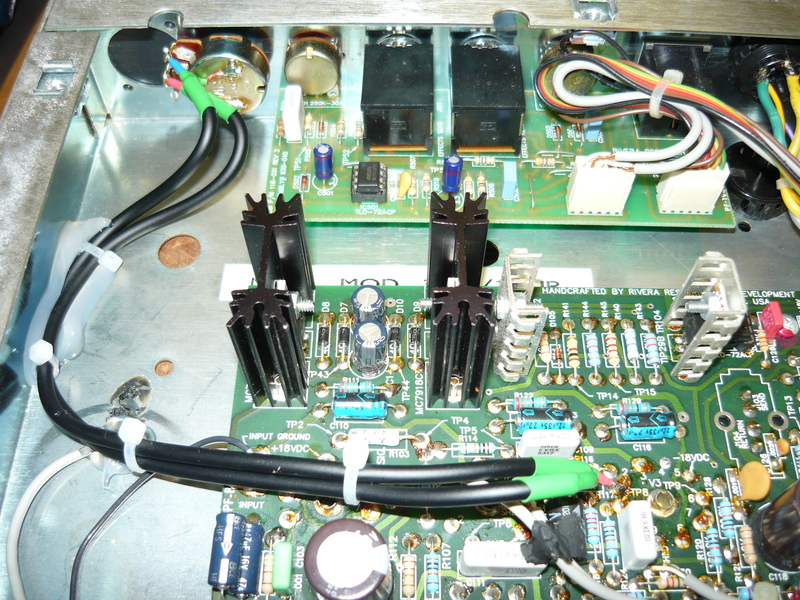 (printed circuit board), so easy replacement is out of the question – the board has to be stripped out, ie removing all control knobs, nuts, screws, etc. Is this for real ?? 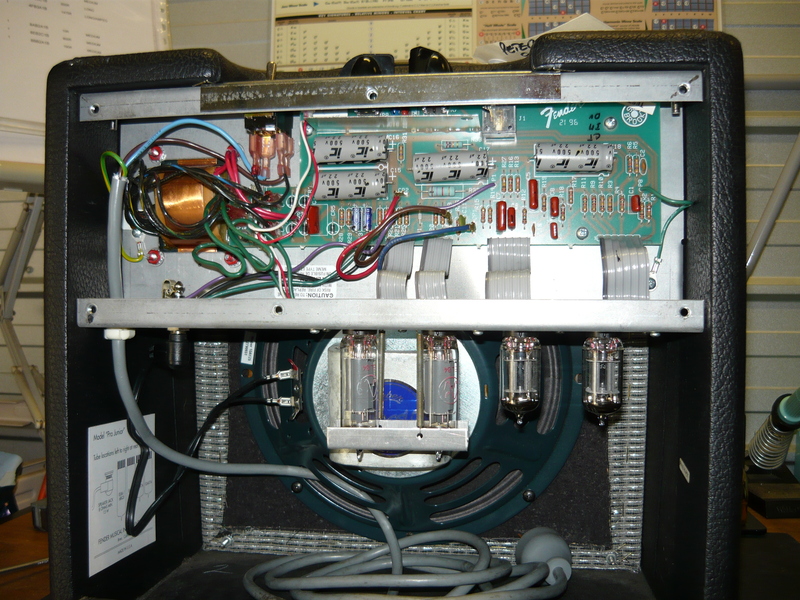 As this fuse is likely to blow several times during the life of this amp, the first MOD we will implement is to wire the fuse to an external fuseholder on the chassis rear panel, easily accessible to all. 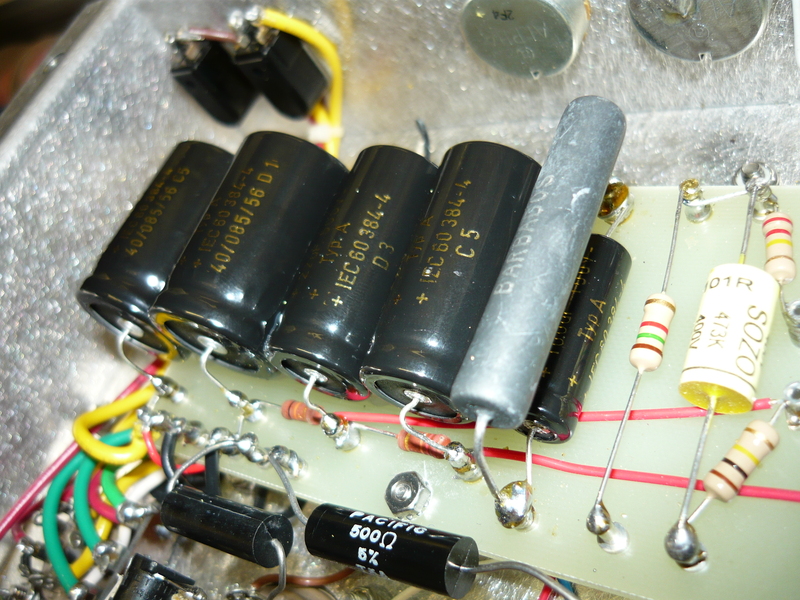 The HT fuse is T1.6A. 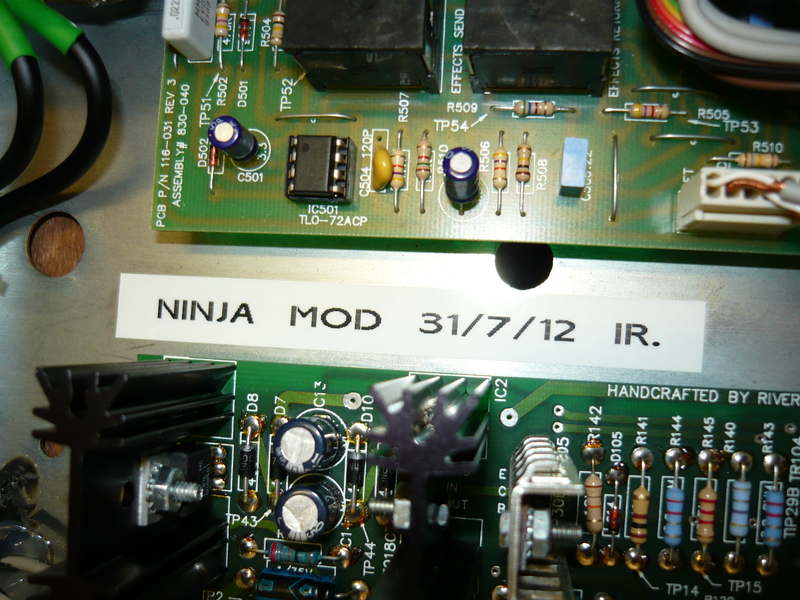 You can see this MOD completed in the photos, plus the Dymo labelling. 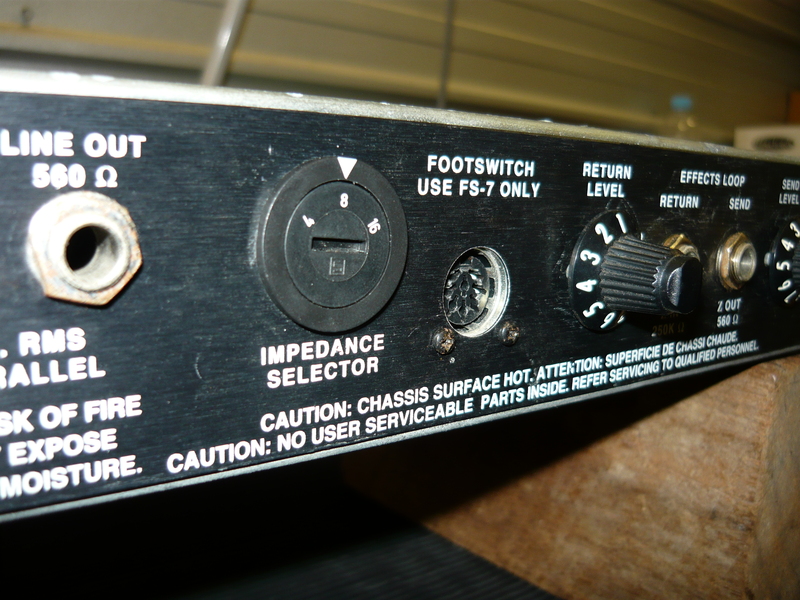 One of Peavey’s favourite design tricks is to wire the valve (tube) heater filaments in series rather than parallel, even including the output valves. 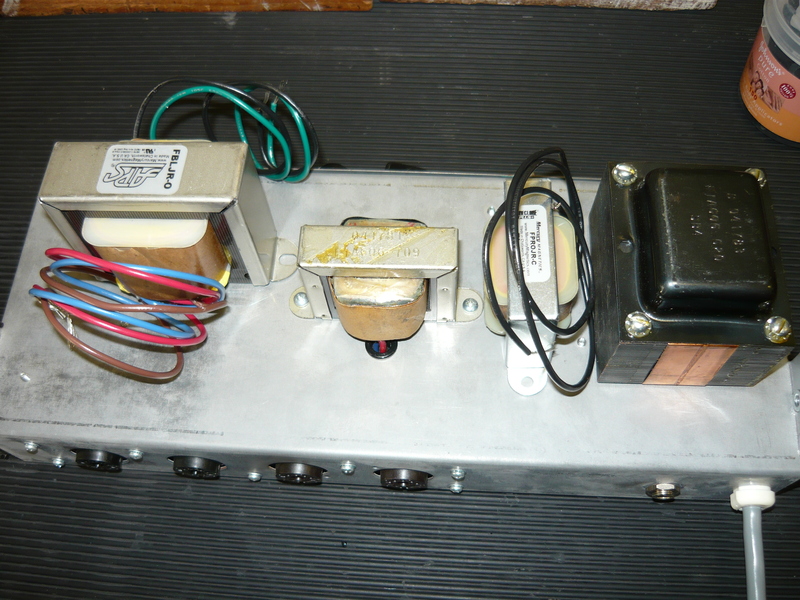 There can be various combinations of series heater arrangements in the one amp. Without a detailed schematic diagram on hand, this can be very confusing, especially in amps with a higher number of valves, eg the 6505 combo. Basically, if you remove any valve from its socket, the other valves (or possibly just some of them) will not power up. 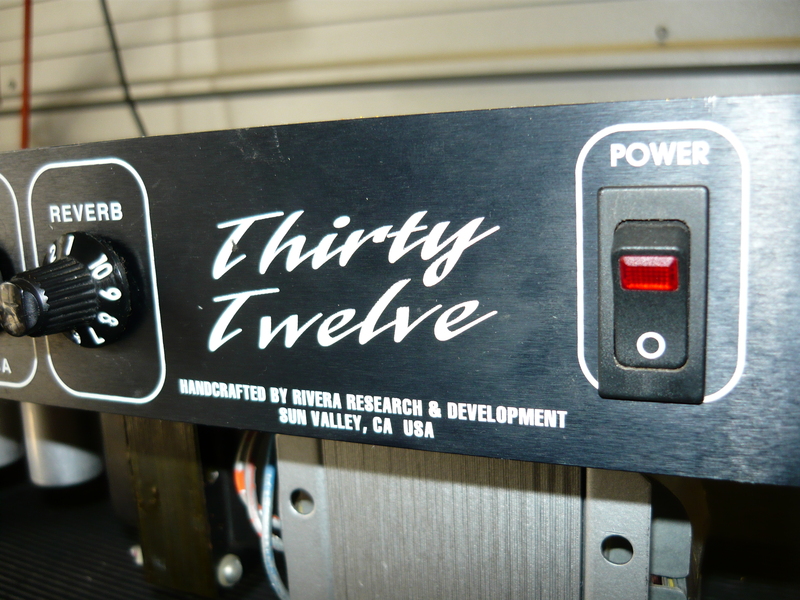 For each Peavey model, we build up a file of such idiosyncrasies so that we don’t get caught out twice. So, we have reached the point when we intend to install a matched quad of JJ 6L6GC output valves. 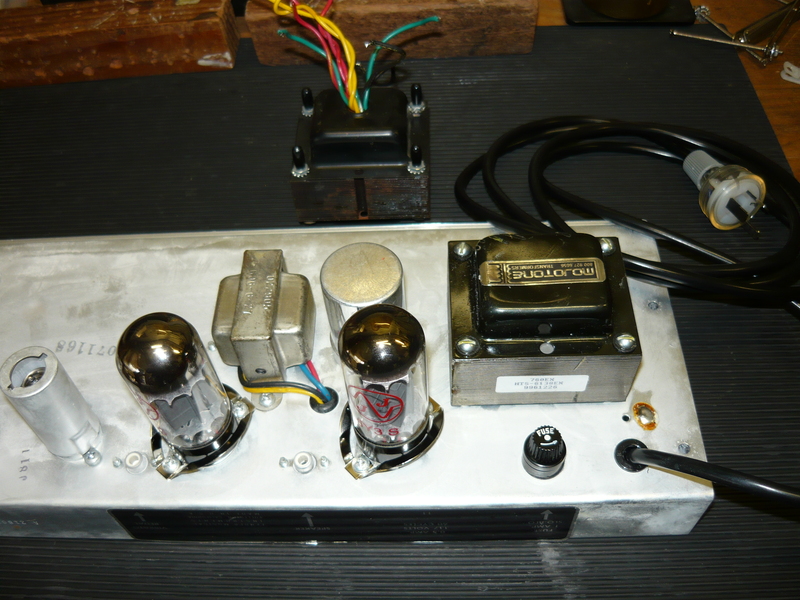 These valves should sound very good in this style of amp. 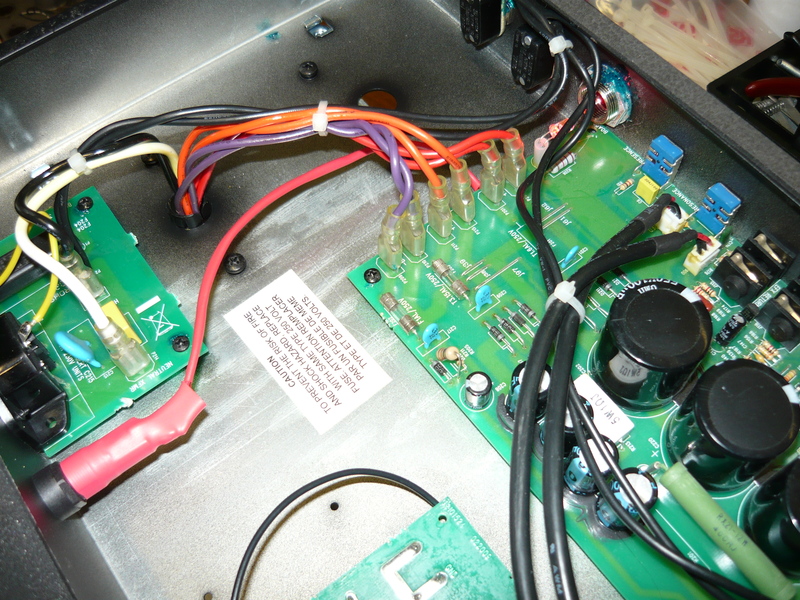 The next logical step after installing any output valves is to rebias the amp. 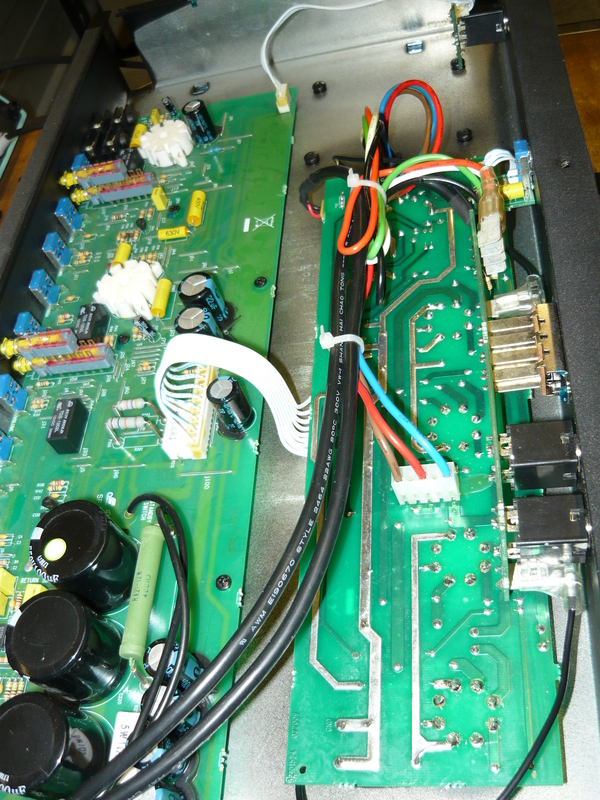 However, the bias supply in this amp is not adjustable, nor is there any provision to monitor the current draw of the 6L6’s. HUH ?? 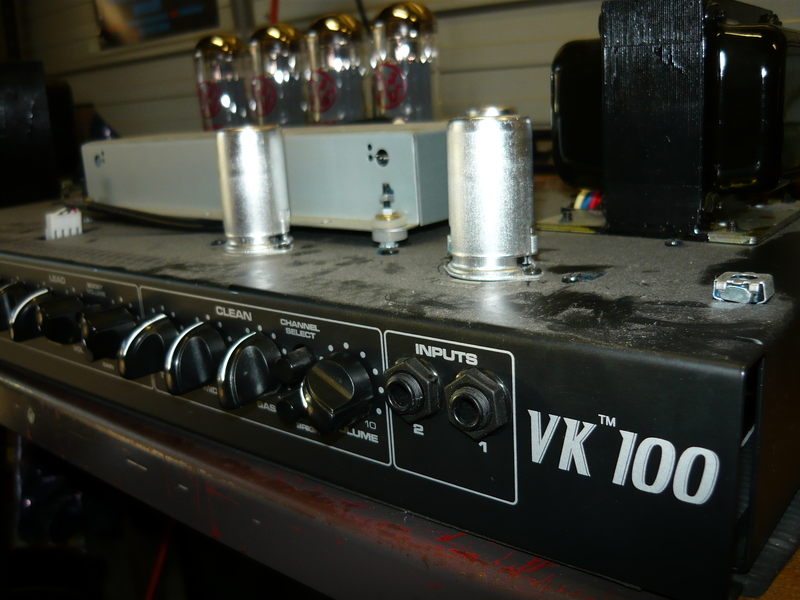 The idea that anyone would design a 100 watt valve amp with a non-adjustable bias supply in this day & age is beyond comprehension, but that is the situation with the VK100. 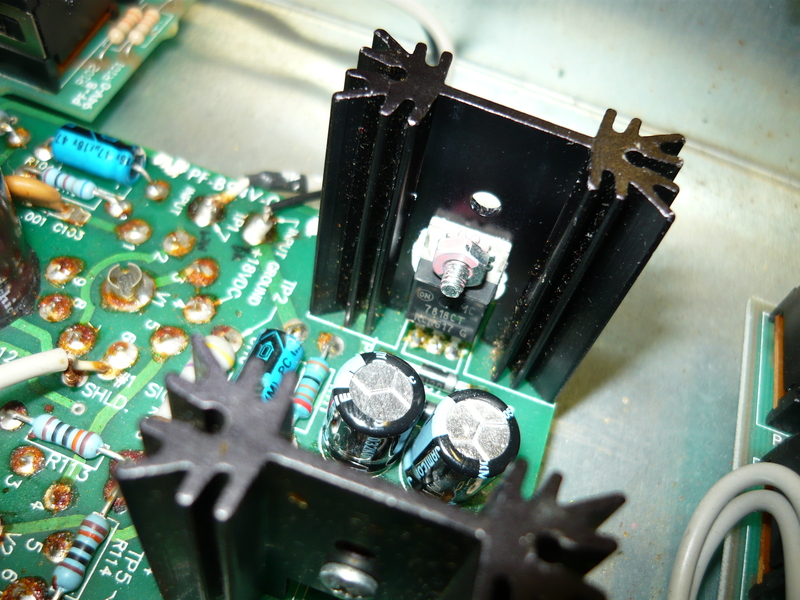 The amp initially appeared to be slightly under-biased, so we replaced R211 with a different value which resulted in a correctly biased quad of JJ’s. 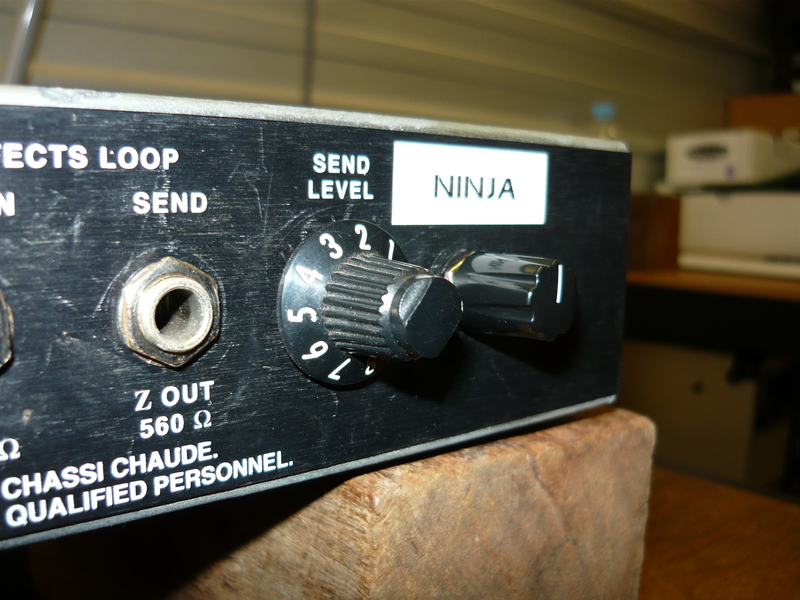 Next time this amp comes in, we will install a 25-turn trimpot in place of R205, which will solve the problem once and for all. 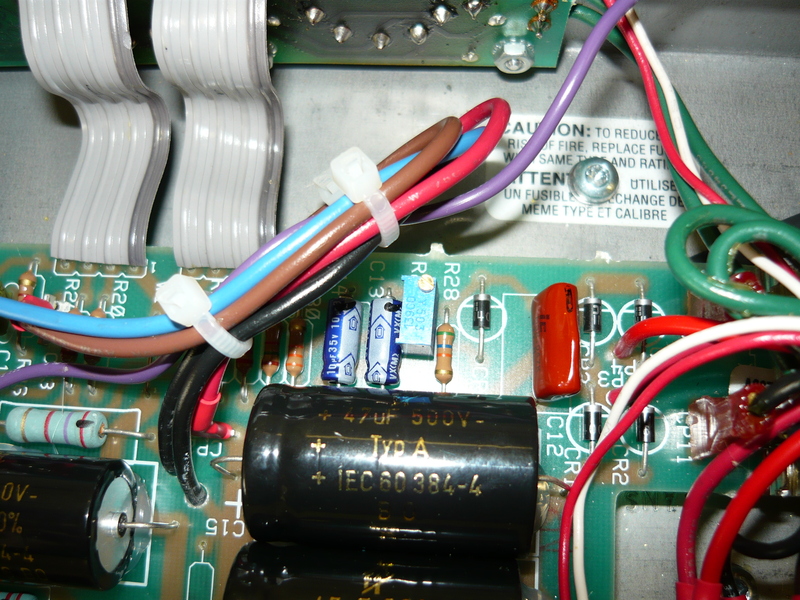 We also installed 470K resistors across high voltage supply capacitors C202 & C204, as these caps were holding their charge (nearly 500V DC) long after the amp was switched off, complicating the service job. This has no effect at all from the customer’s point of view, but makes life easier for the next service tech. 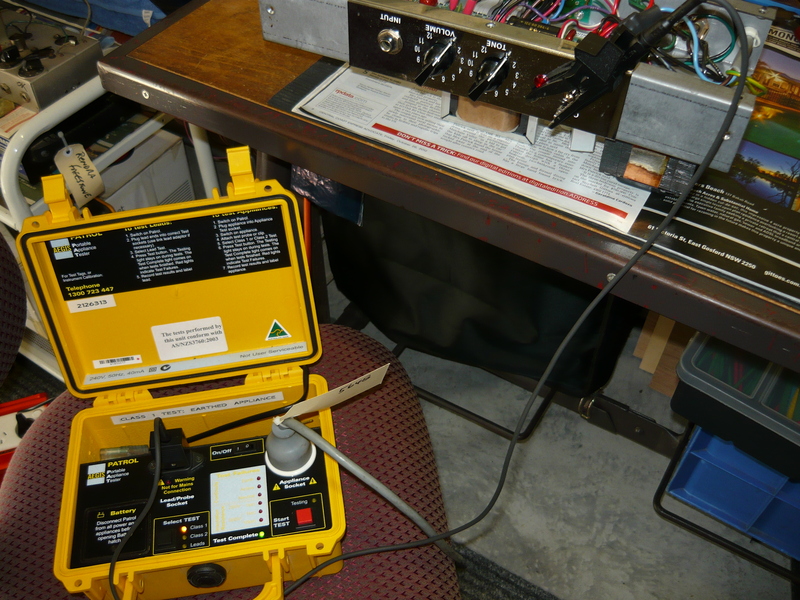 The remaining tasks are an electrical safety test (PAT test), power output test and burn-in test, with a final play test to complete the job. 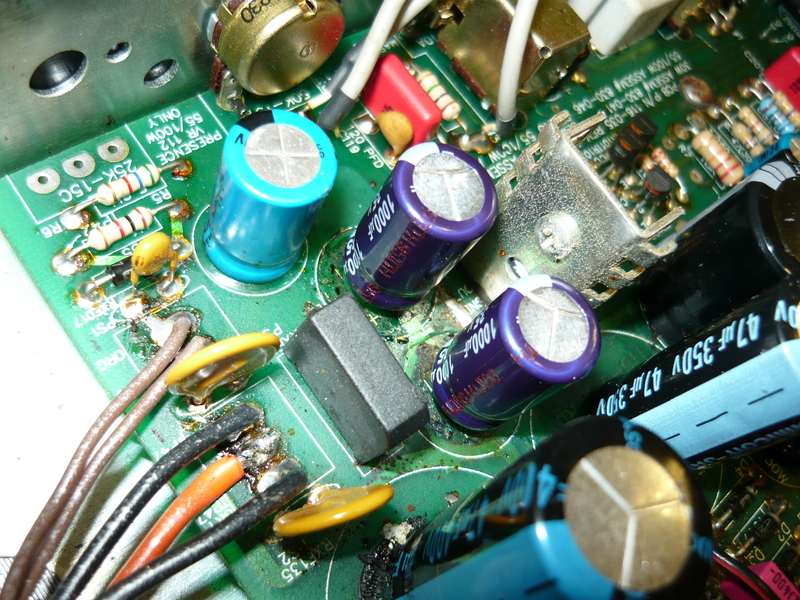 The amp delivered 30V into an 8 ohm resistive load, which translates to 112 watts. When we first attempted a power output test, we couldn’t get a good clean sine wave output, even from injecting our test signal at the FX Loop ‘return’ jack. 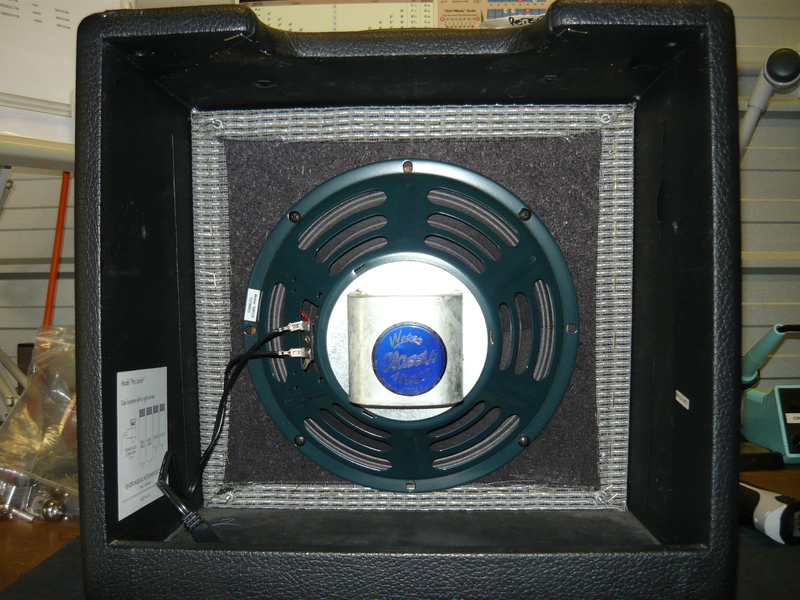 This was most perplexing, until we discovered the mysterious Texture pot on the rear panel, near the speaker jacks. 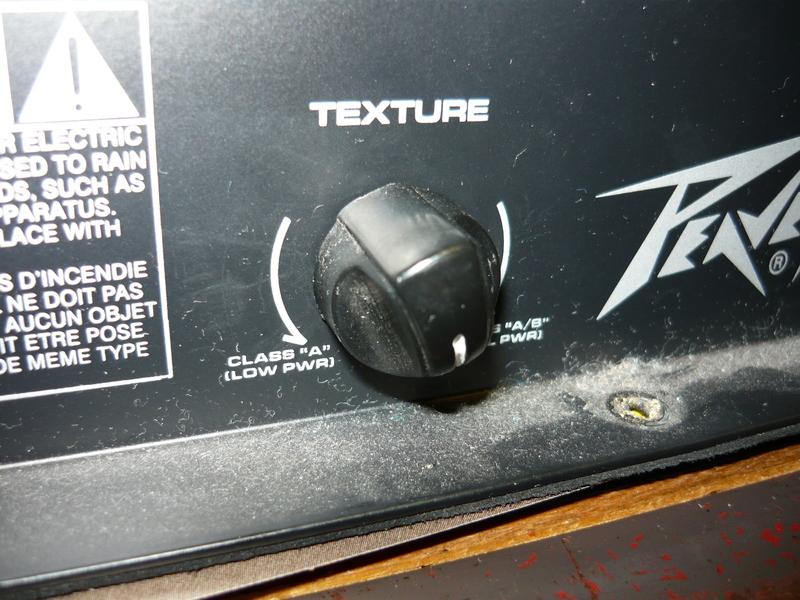 The Texture control claims to sweep the power amp from Class-A (c.c.w.) to Class-A/B (c.w.) mode of operation. This is complete nonsense ! What it actually does is convert the amp from normal push-pull (Class A/B) operation to a kind of quasi single-ended mode by shunting away some of the signal from one of the two outputs of the phase-splitter stage to ground. This only roughly approximates the behaviour of a single ended amp and naturally the resulting waveform is somewhat distorted, which is what caused our initial confusion. The only way to carry out a meaningful sine wave test is to set the Texture control to fully clockwise (c.w.). 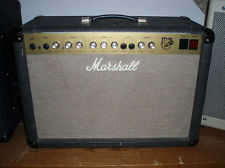 Well, how does the amp sound with a decent set of valves ? Not too bad actually – the ‘clean’ channel sounds very Fendery, with a slightly different EQ sweep, and the ‘lead gain’ channel actually starts off with considerable distortion levels, so any kind of ‘crunch’ tones are just about impossible, but will probably please the younger guys, and the reverb is also pretty good for a short tank driven by IC’s rather than valves. 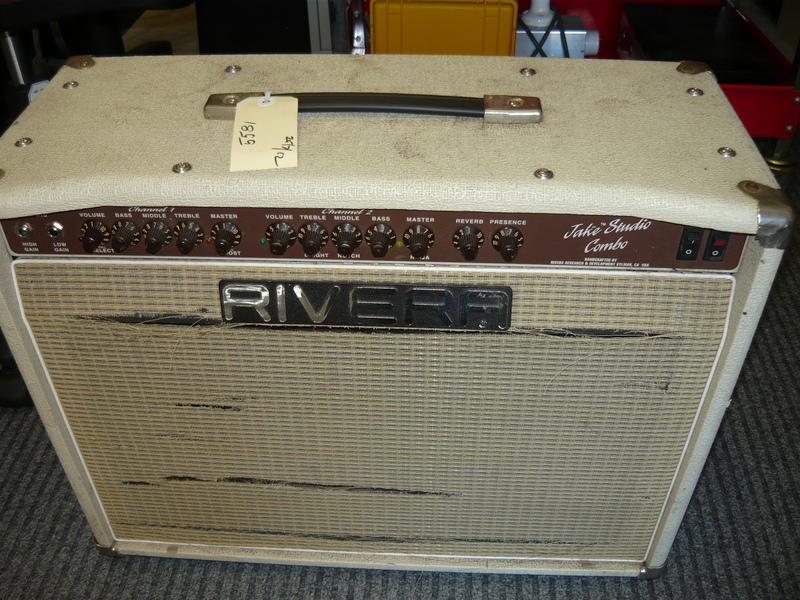 We also provide world-class service to the Peavey EVH amps and the well known Classic 30/Classic 50 models. Thanks for checking in to the blog – I.R.